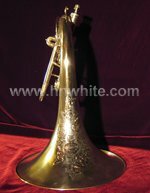 Just a quick word about my collection of instruments, it is my goal to own the best instruments that The H. N. White Company made! 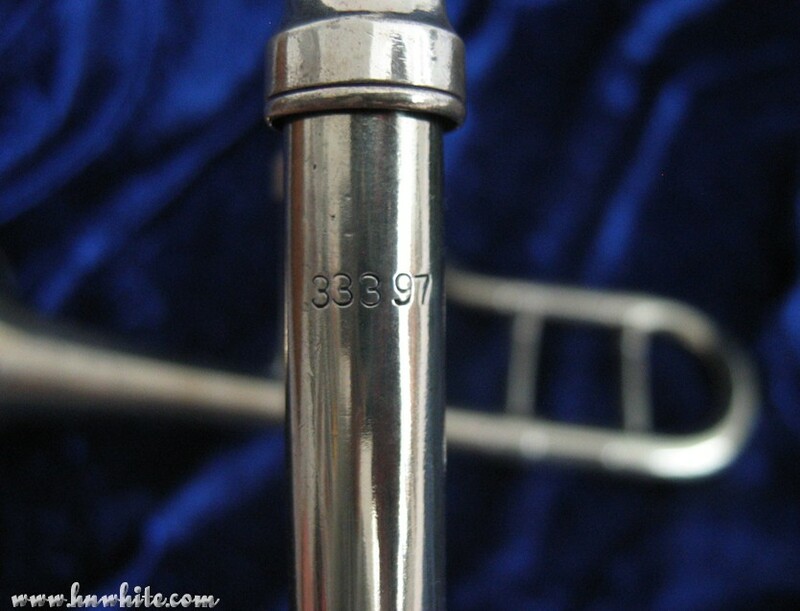 For the most part this means that I am interested in "artist" level instruments but I will consider adding any rare instrument. 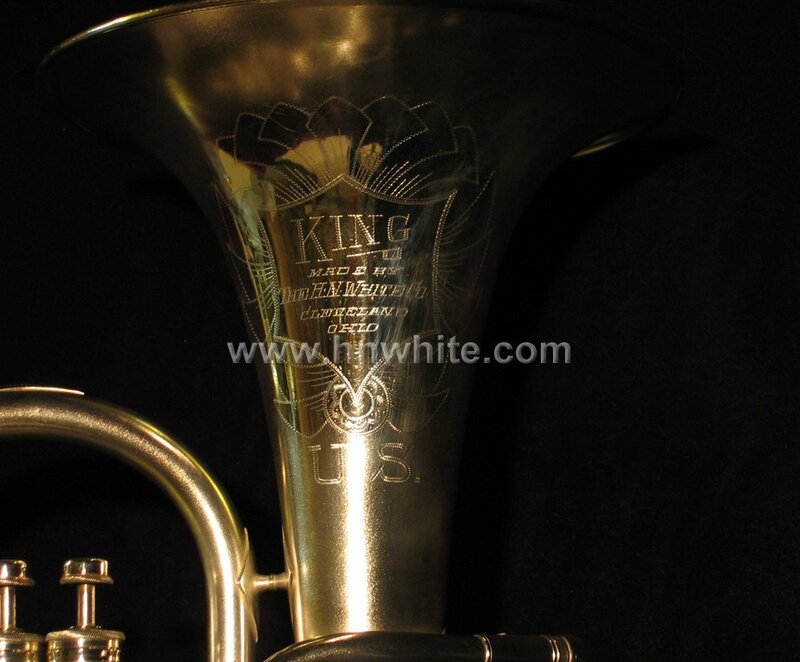 This Collection of H. N. White is the finest collection on the internet with more "artist" level King instruments then any other! 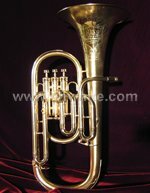 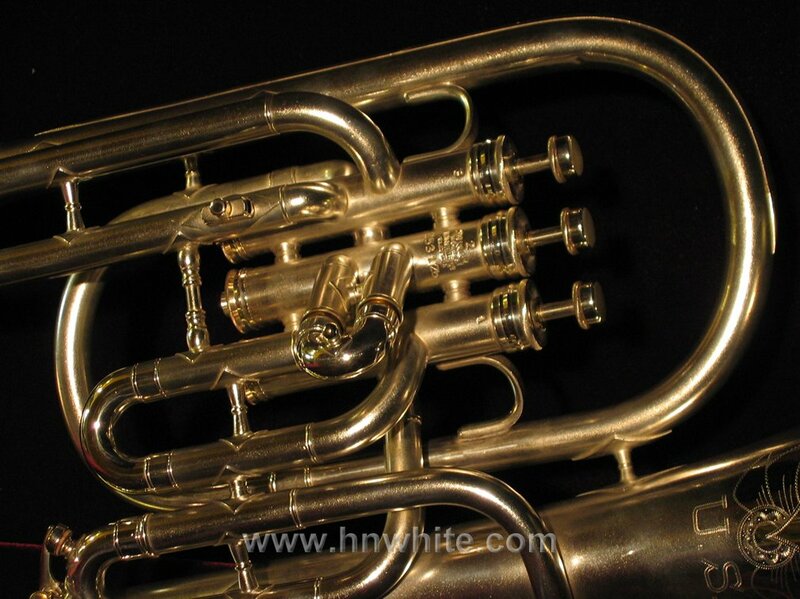 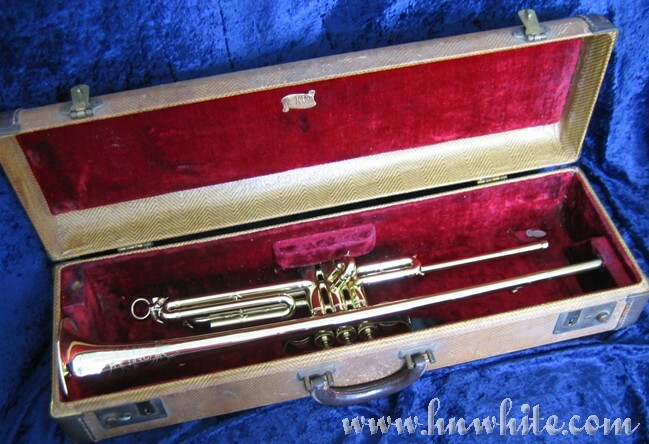 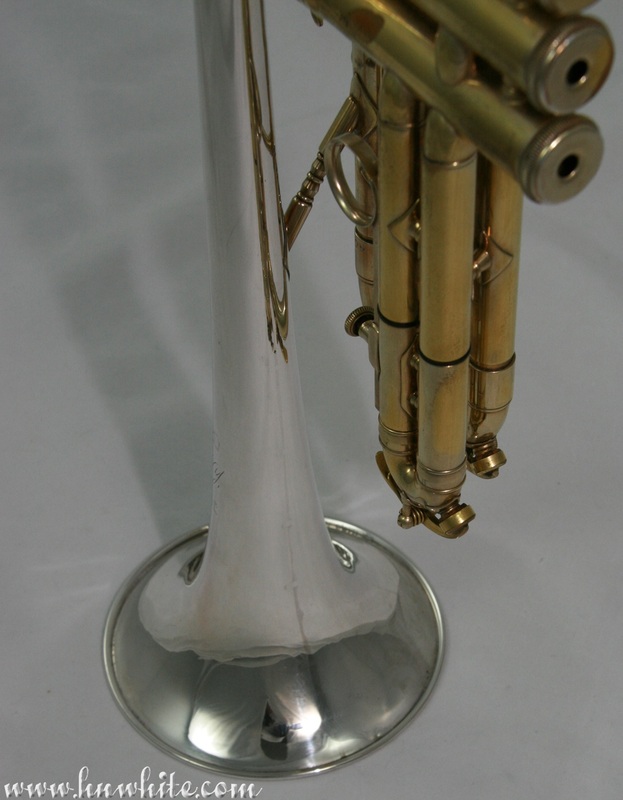 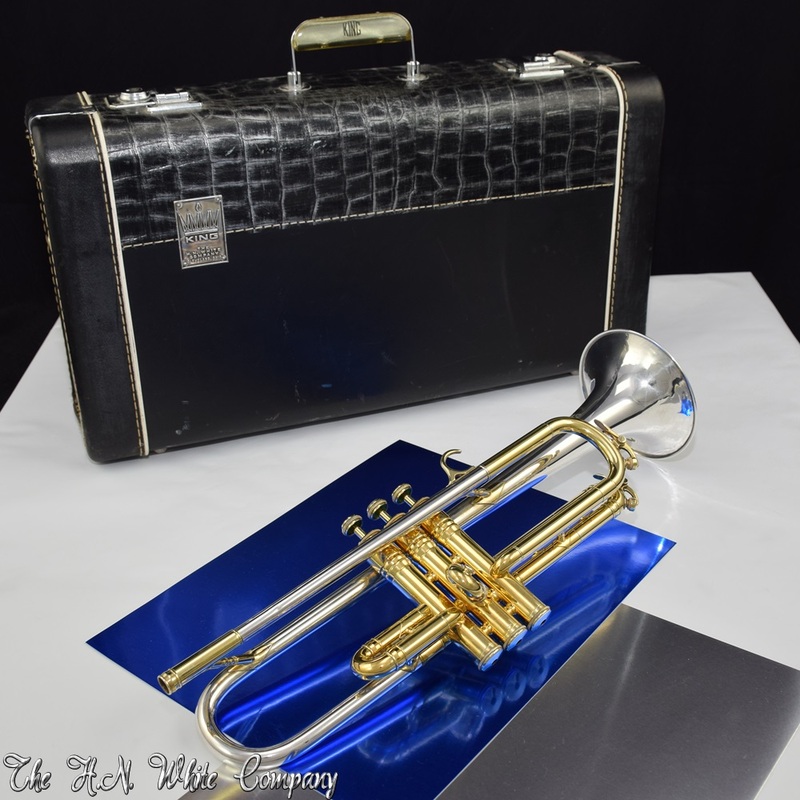 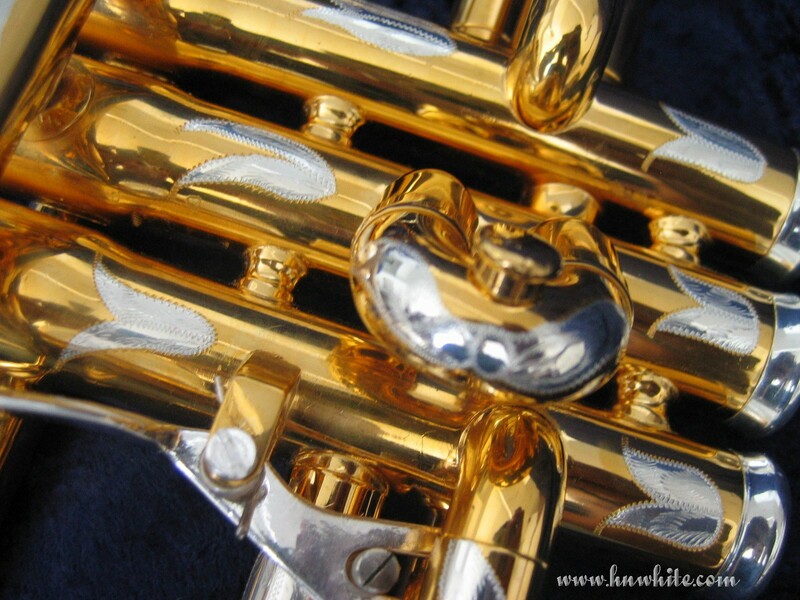 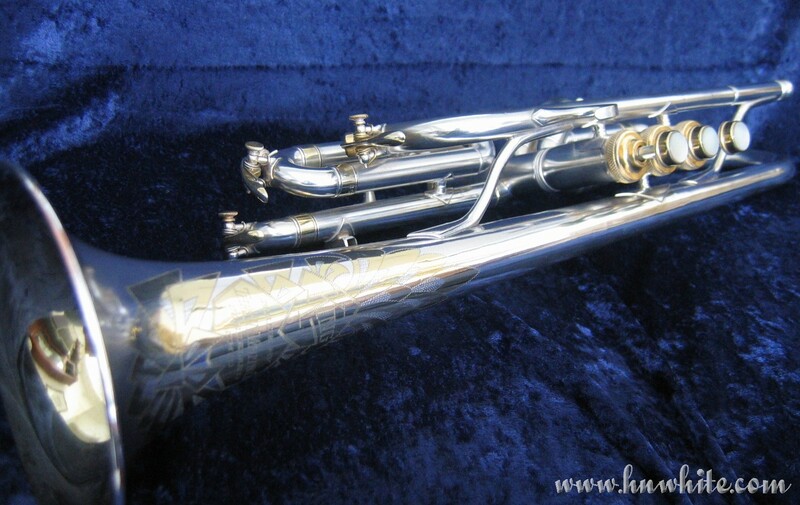 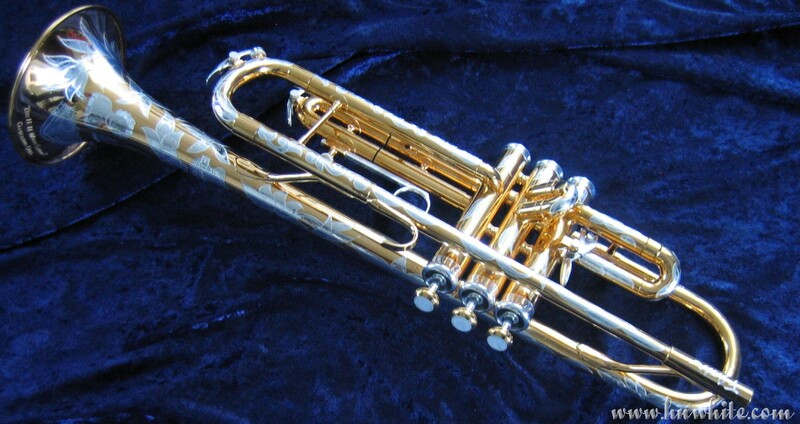 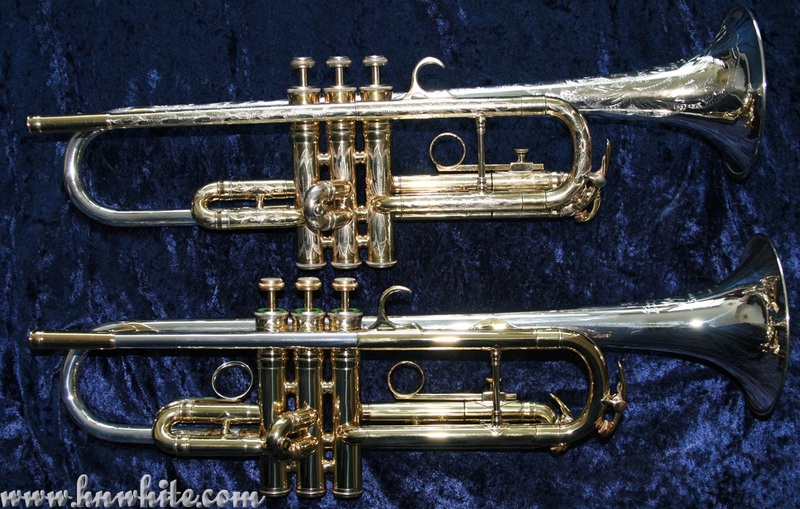 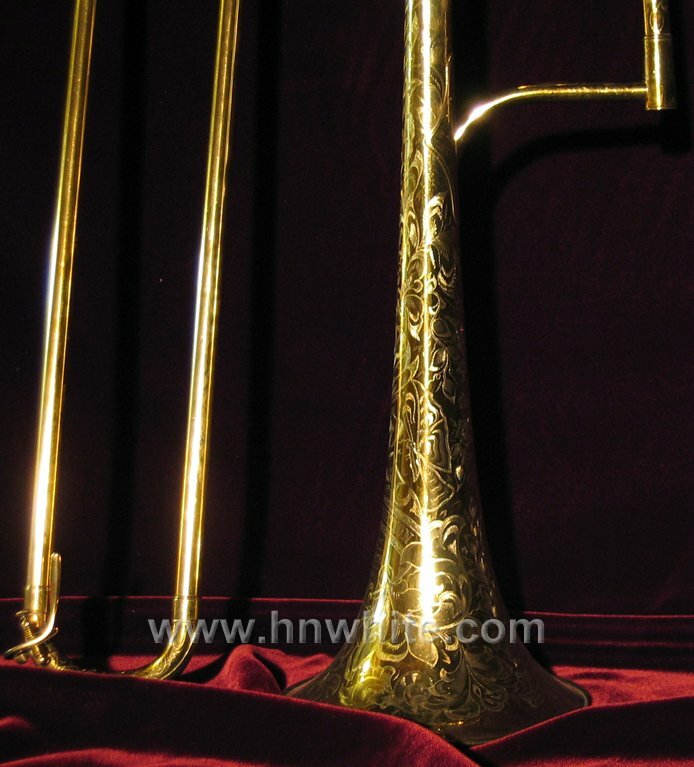 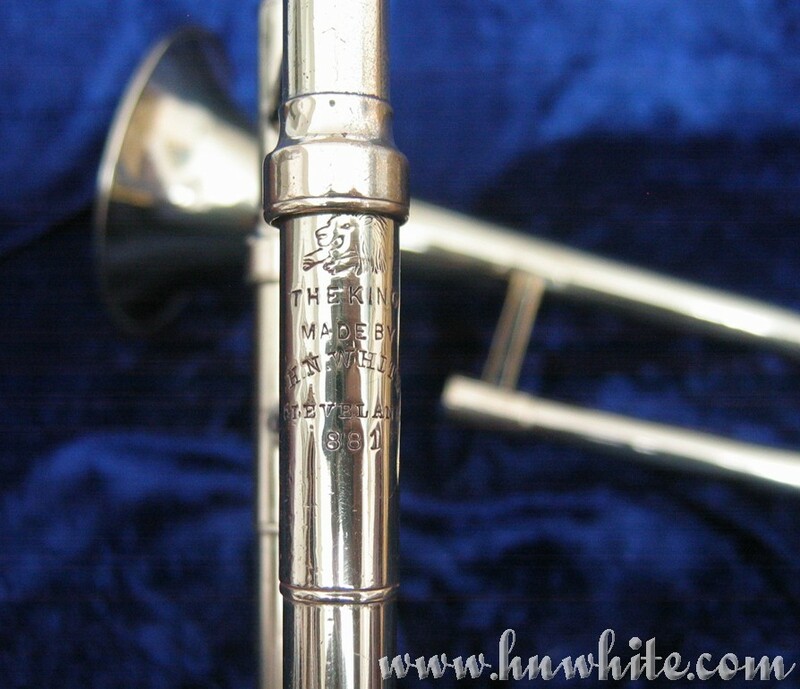 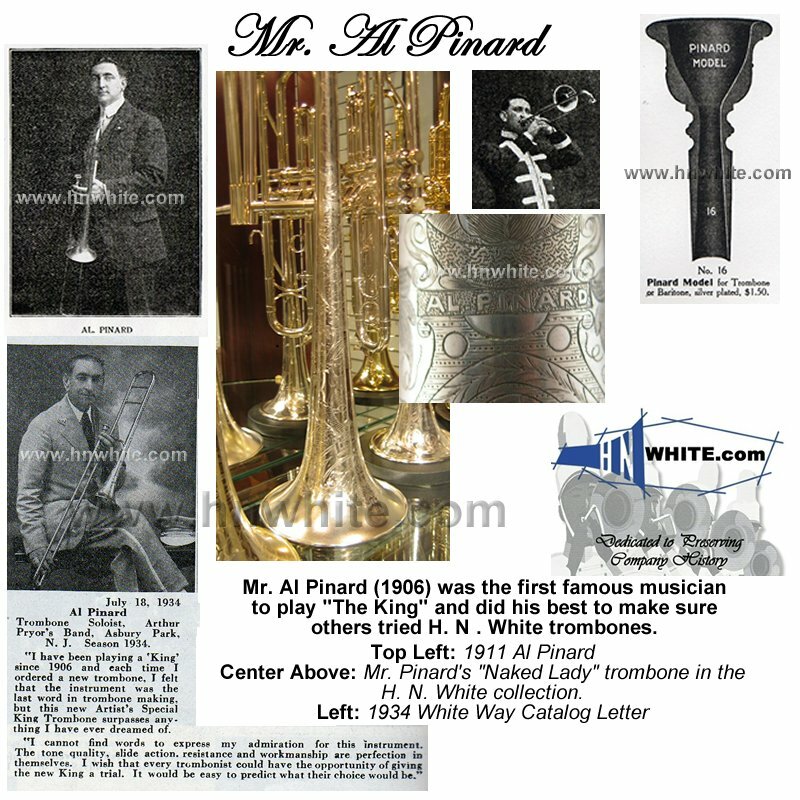 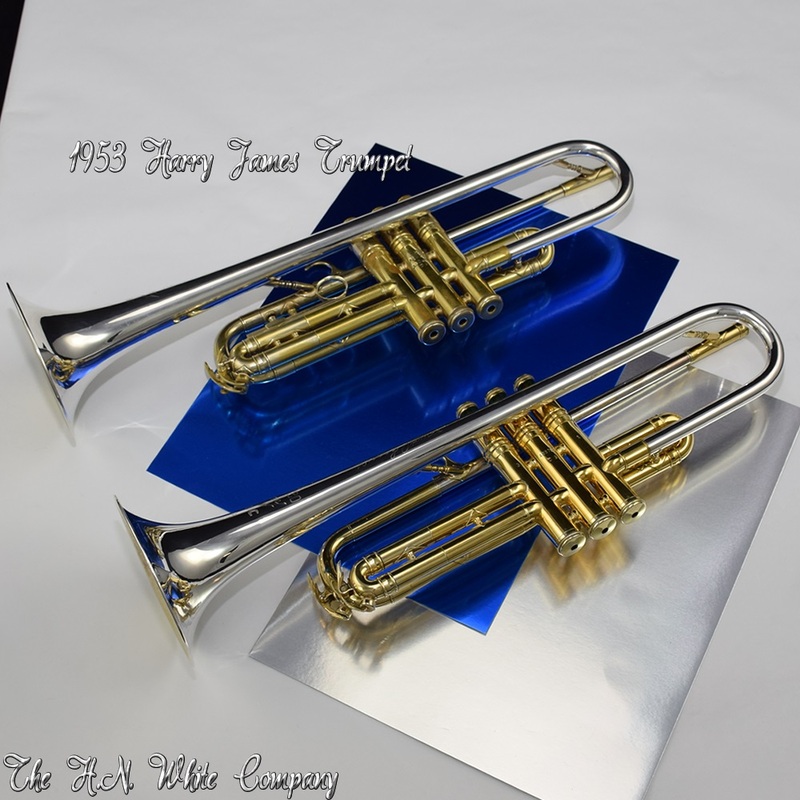 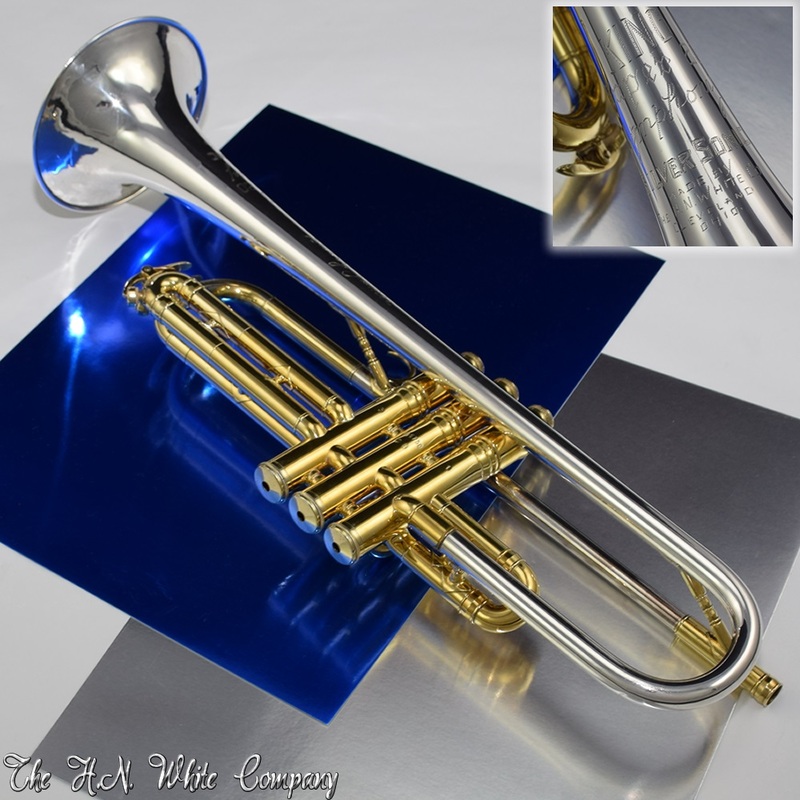 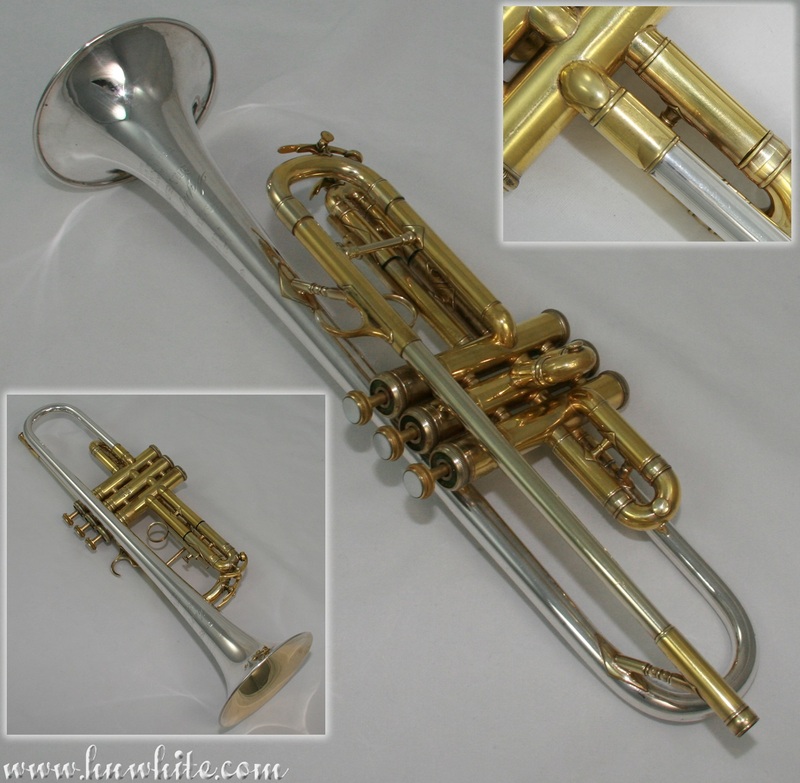 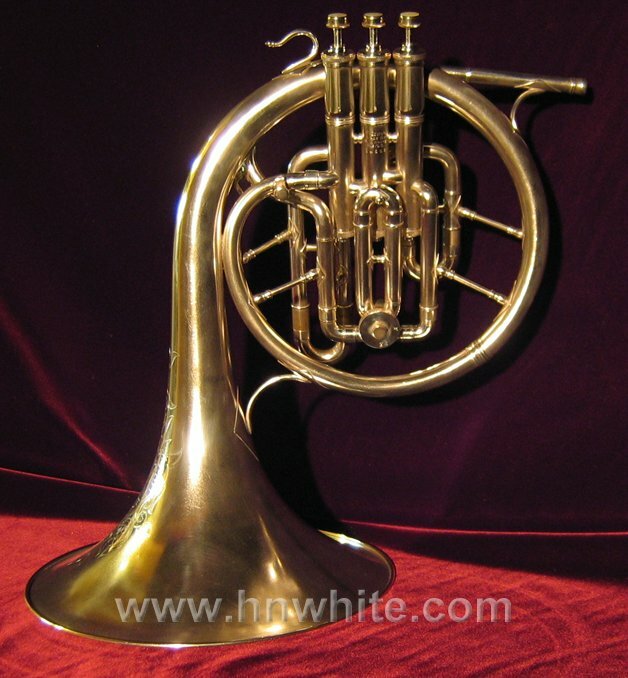 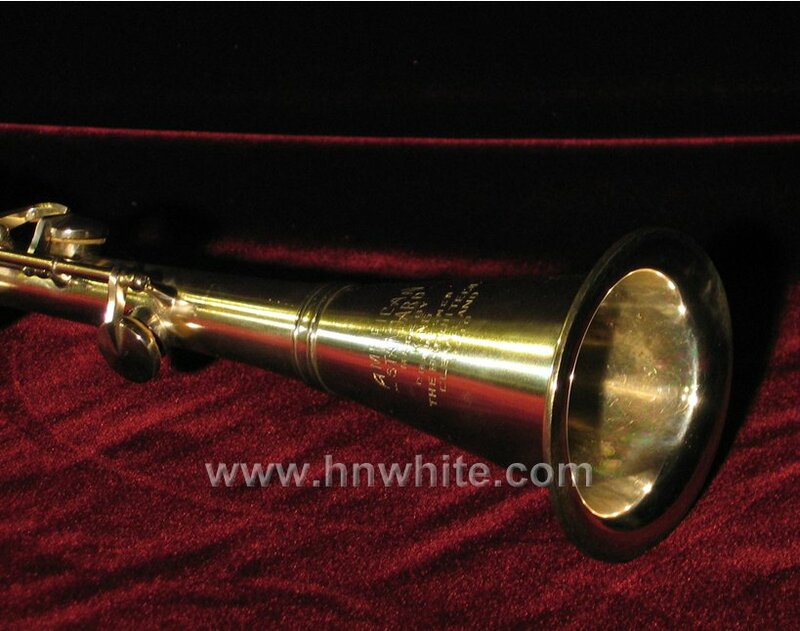 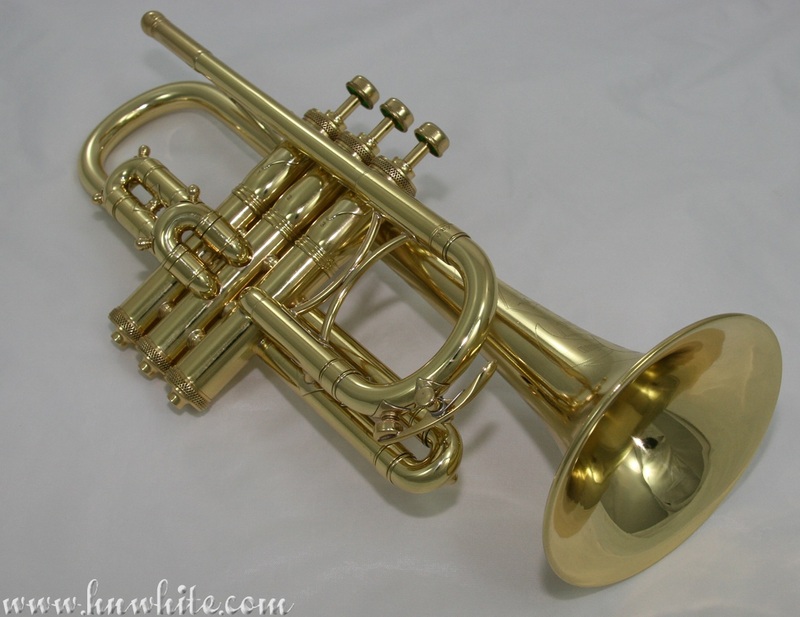 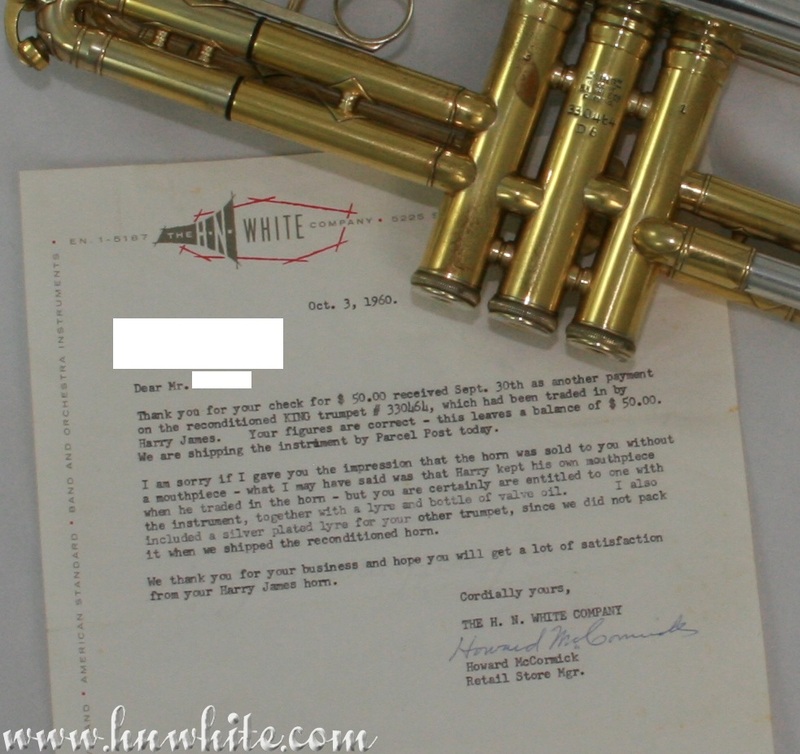 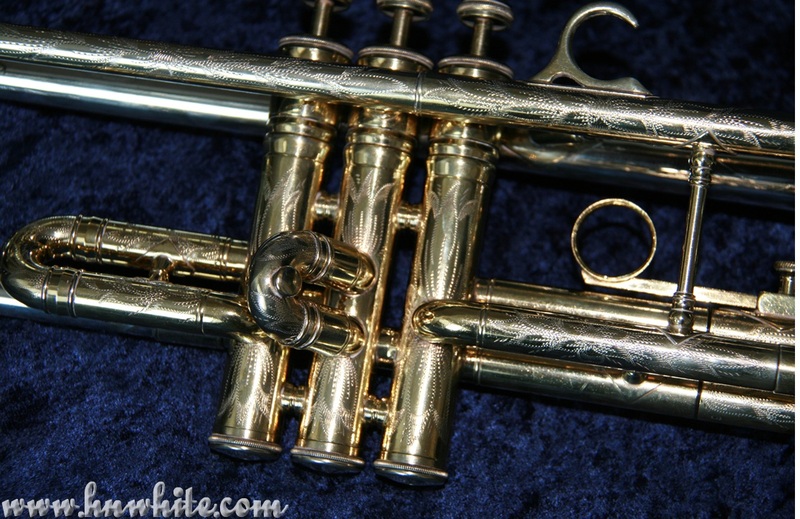 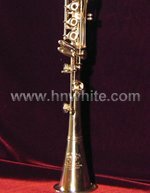 One of the best instruments produced by The H. N. White Company was their trumpets! 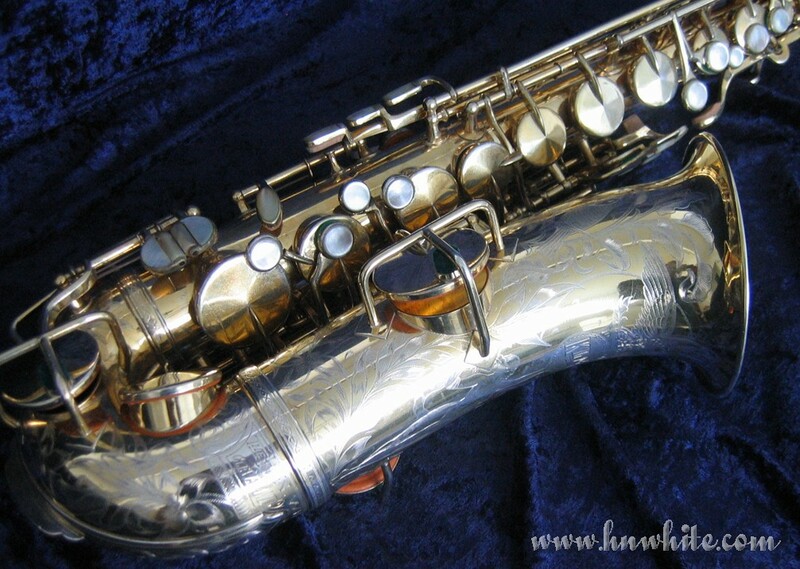 Built like tanks, with a sweet mellow tone that other companies tried to copy but were never able to! 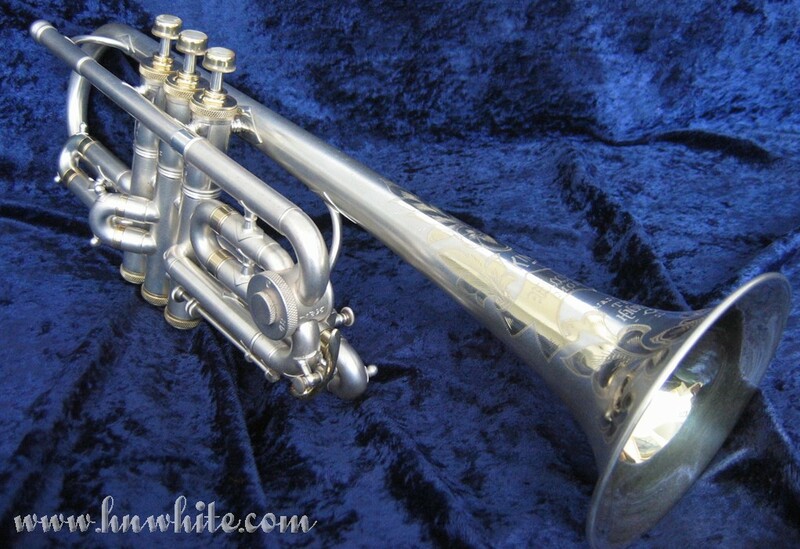 White made trumpets are among the best “mass” made trumpets of all time. 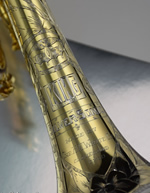 Each trumpet was made by hand from accomplished craftsmen with the finest material and design. 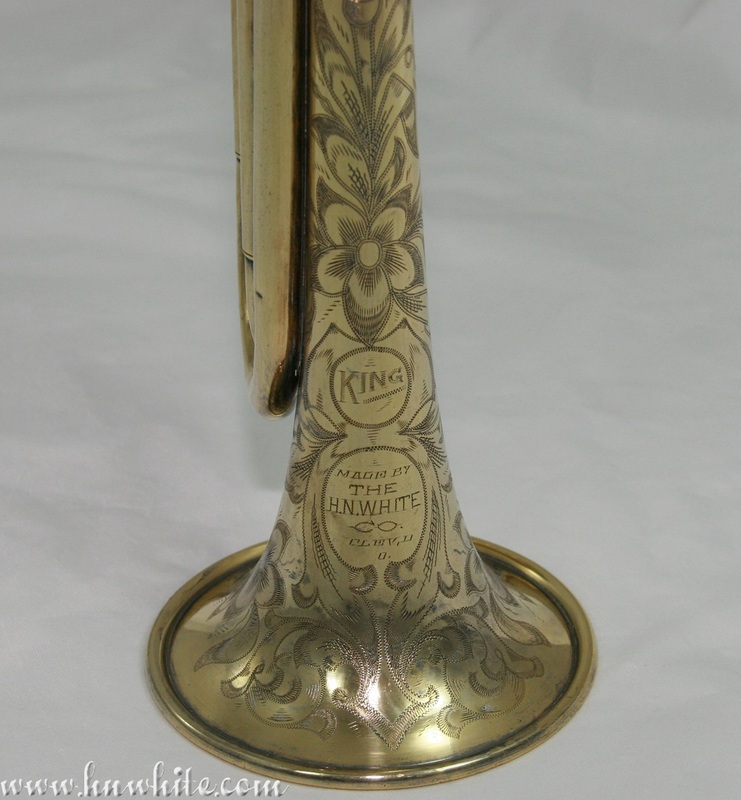 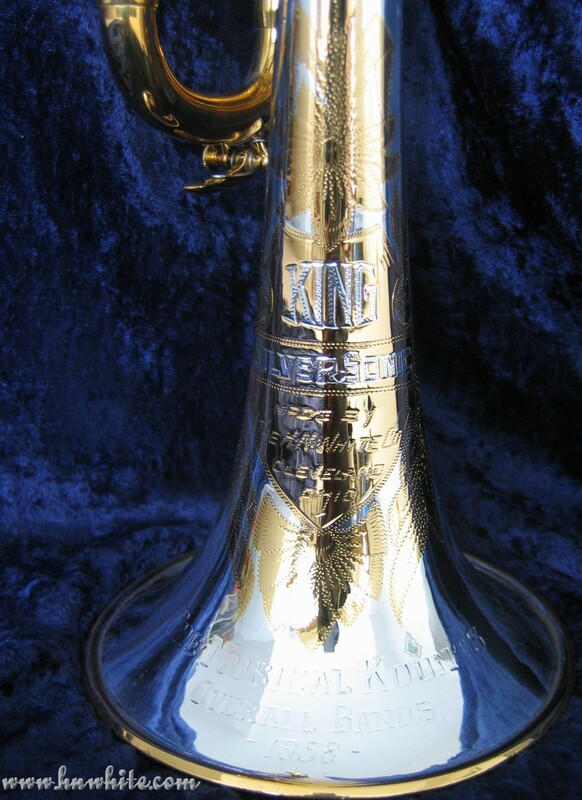 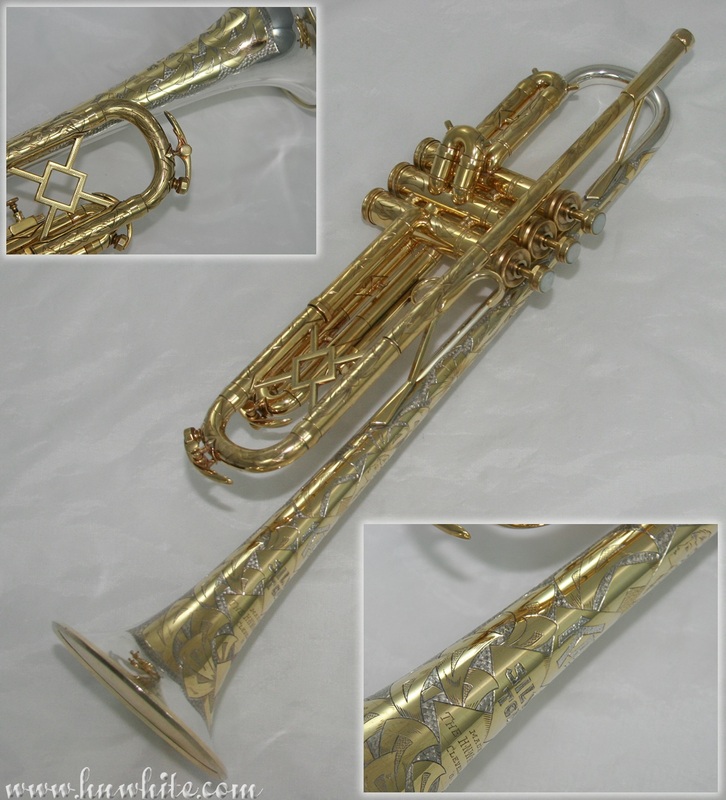 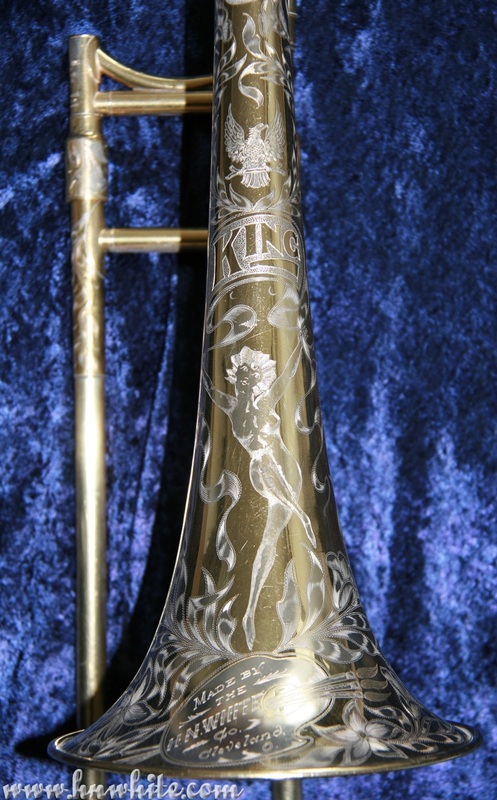 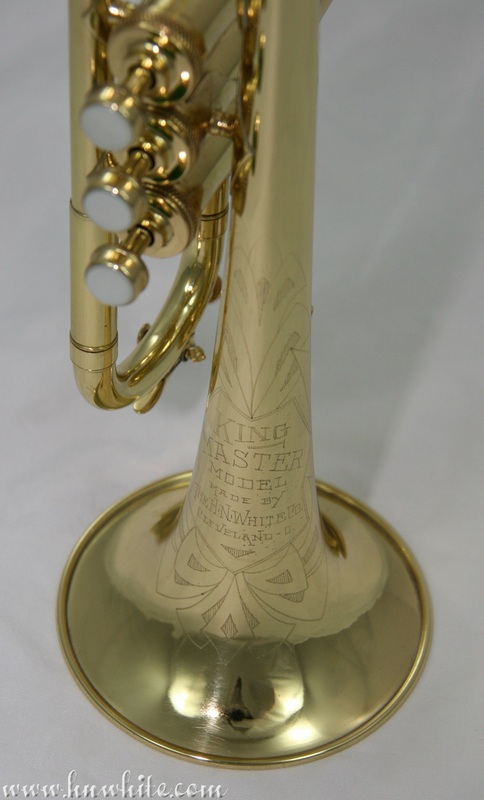 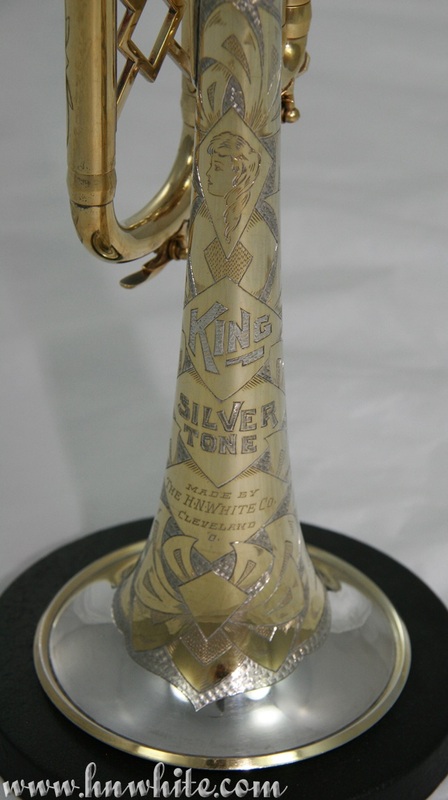 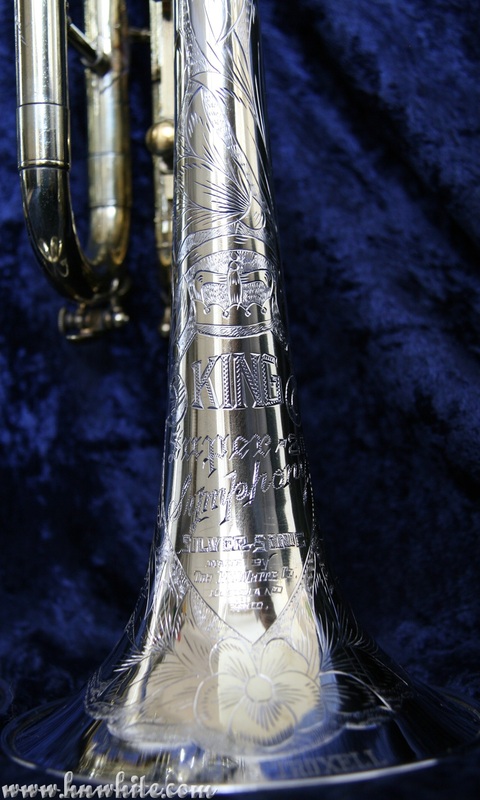 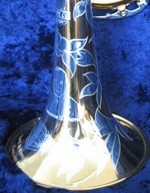 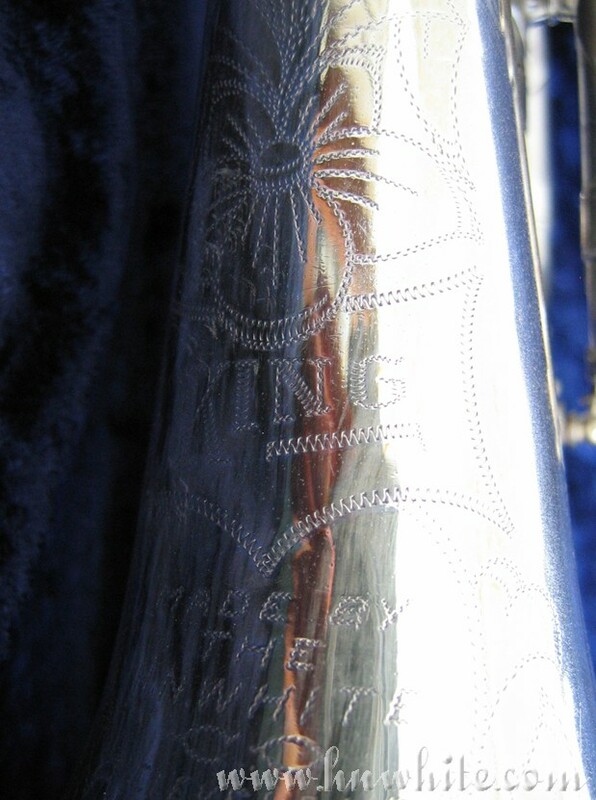 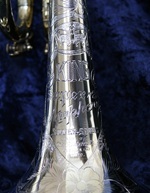 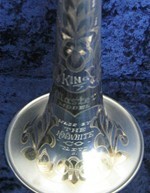 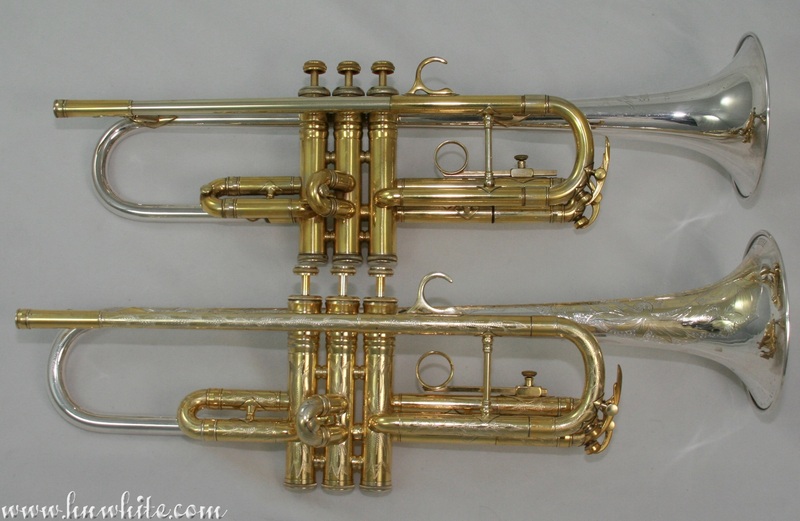 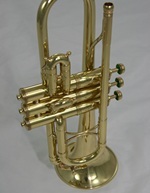 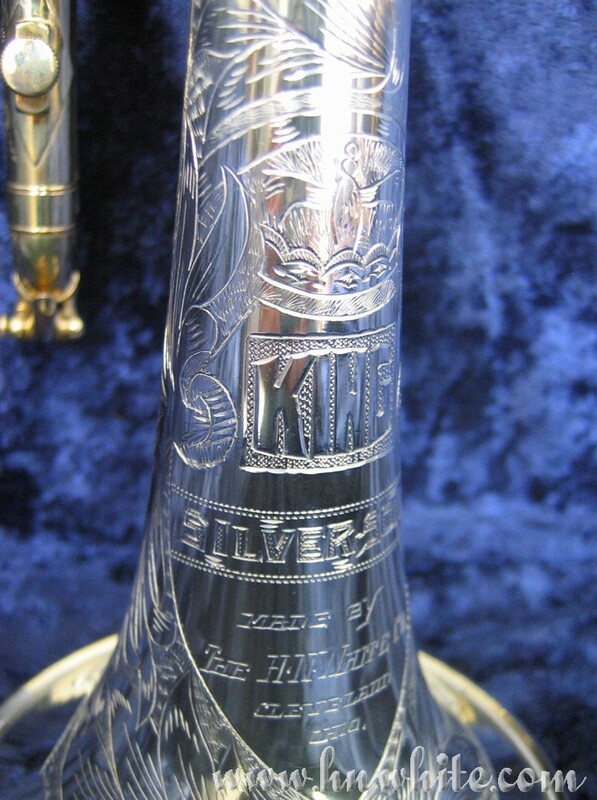 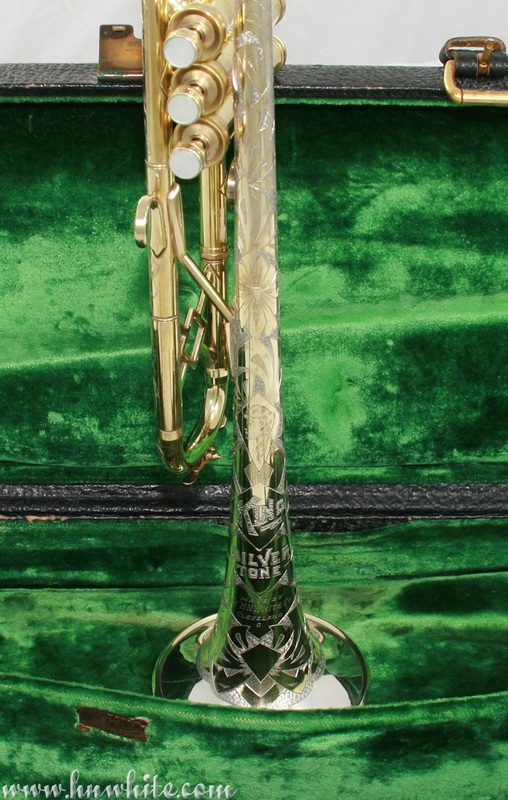 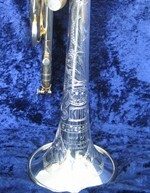 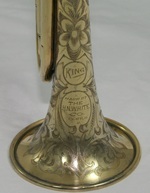 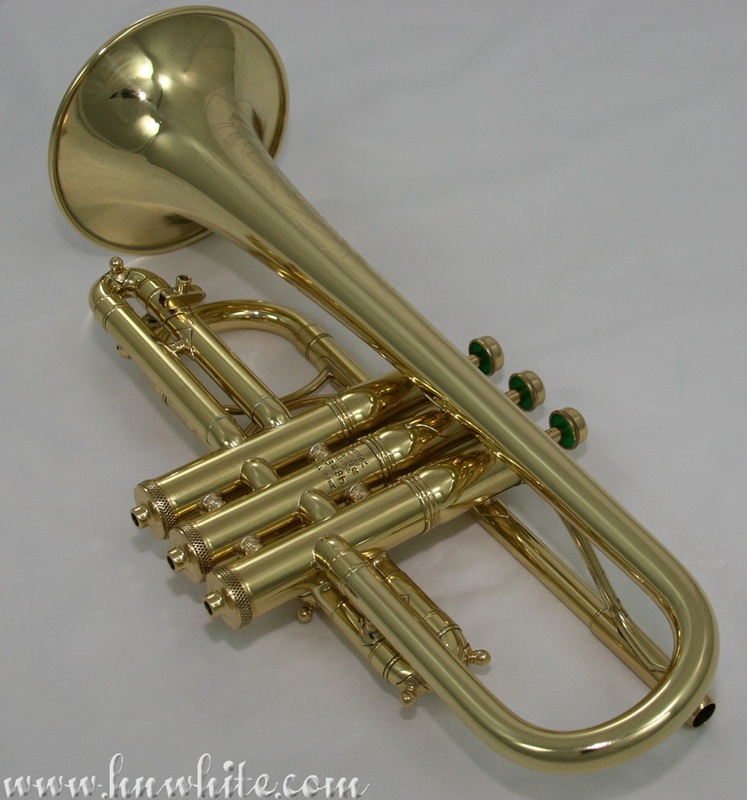 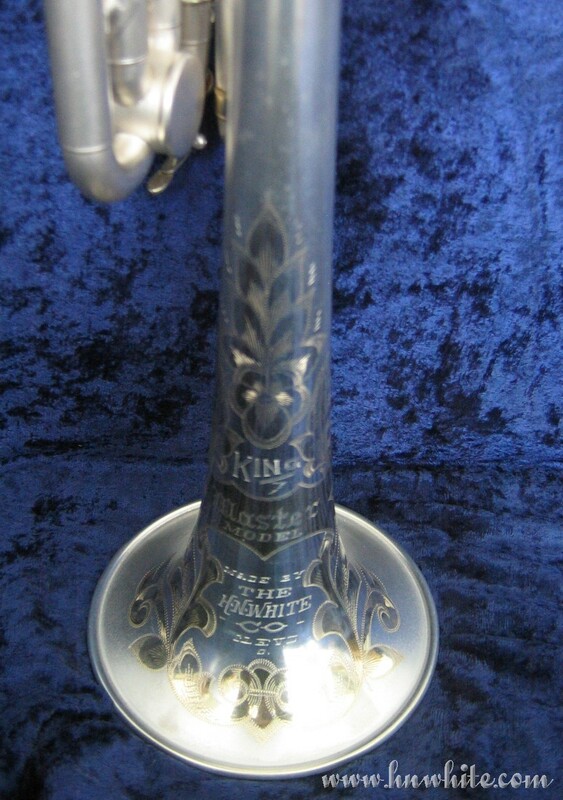 If you interested in buying a vintage King trumpet please go to our store! 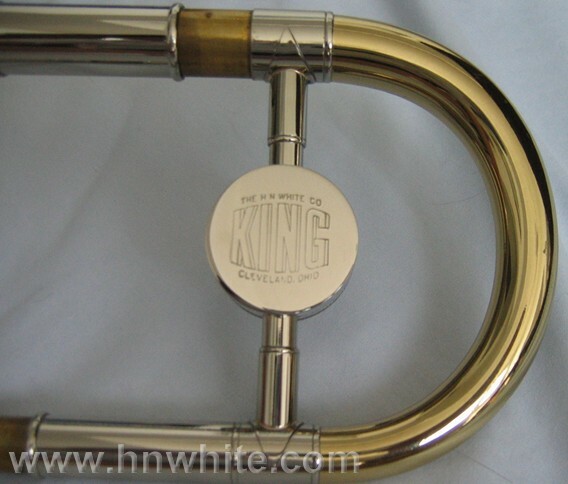 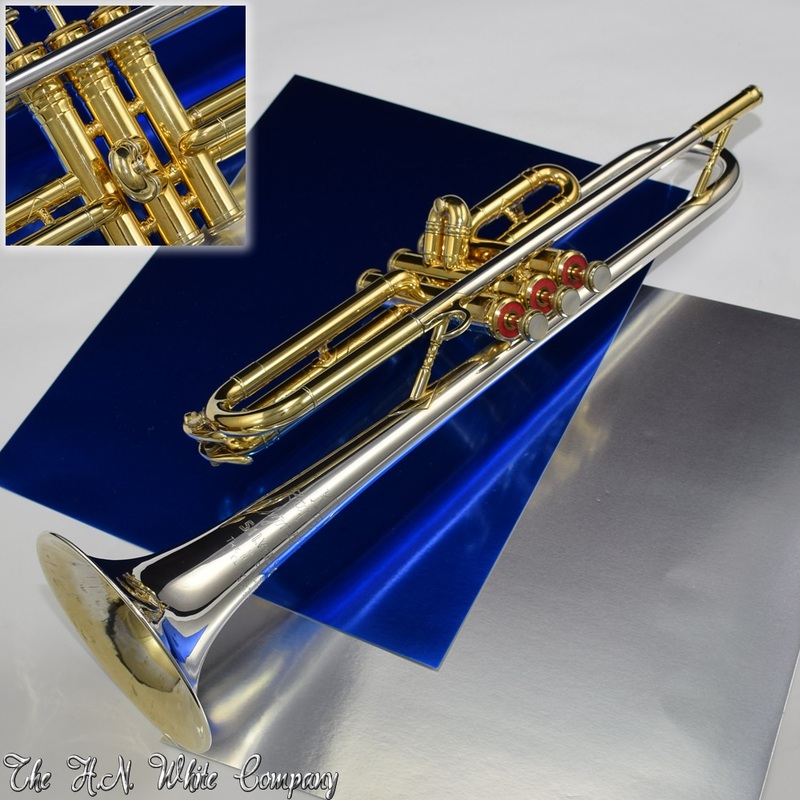 For King Mini Trumpets Click Here! 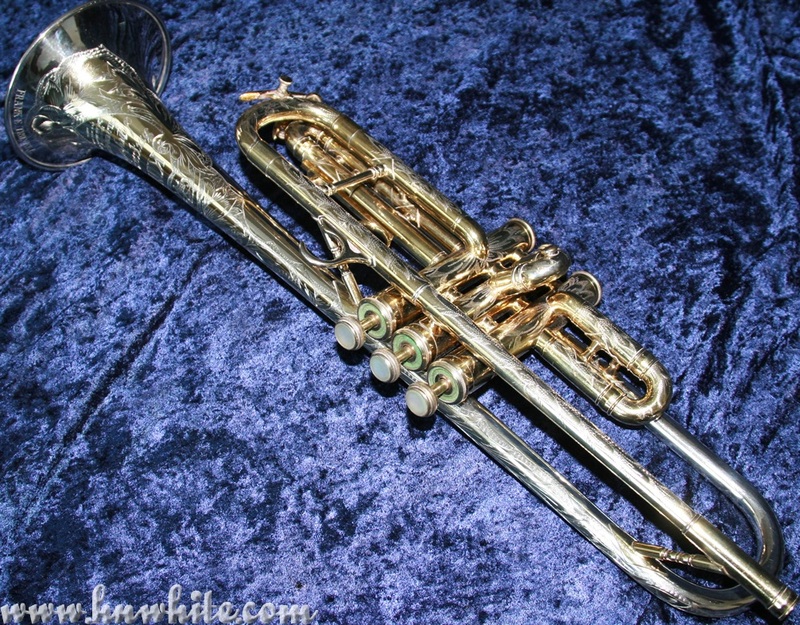 This Vocal Trumpet looks just like it did when it left the factory in 1926. 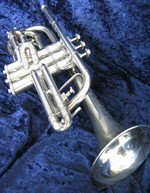 Everything is stock on the trumpet, and the conversion to c is easy and can be done fast. 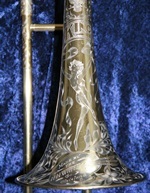 Artist Level Engraving made in 1927. 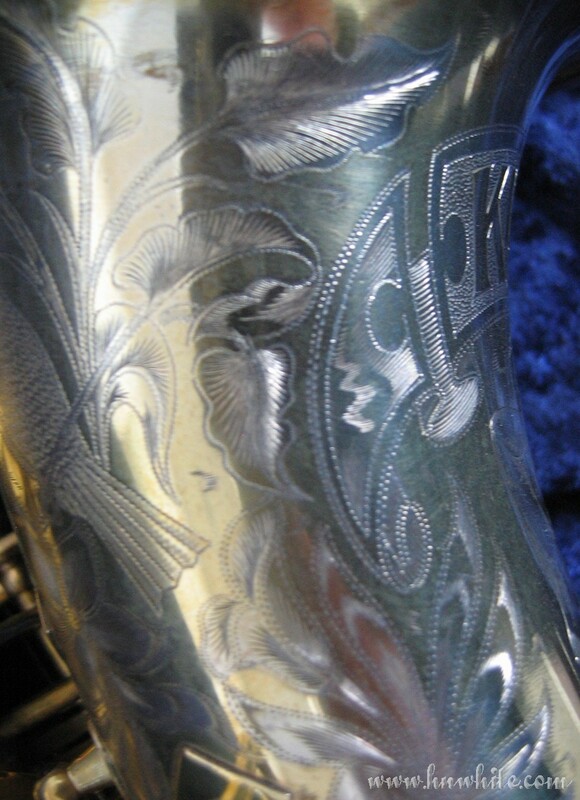 Artist Level Engraving made in 1938. 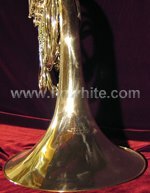 A very unique horn, almost impossible to hit a bad note playing! 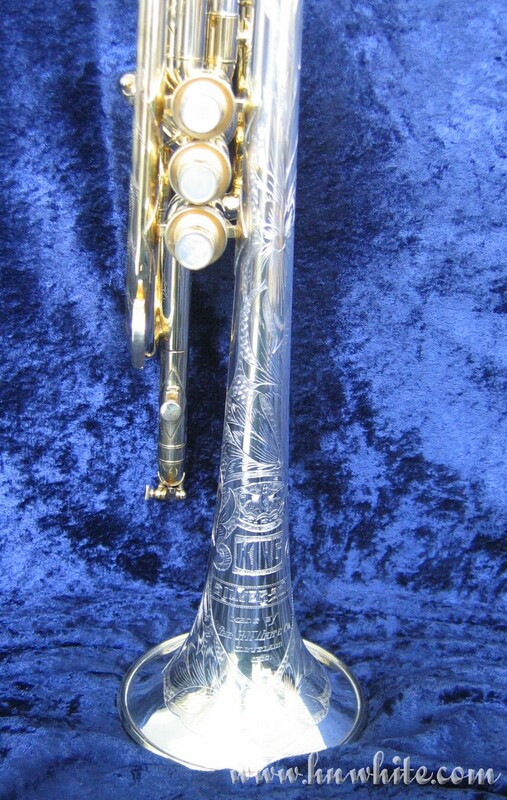 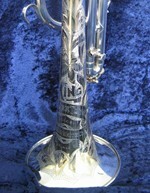 This Trumpet was made for a contest between Cleveland high schools called "The Musical Kounts". 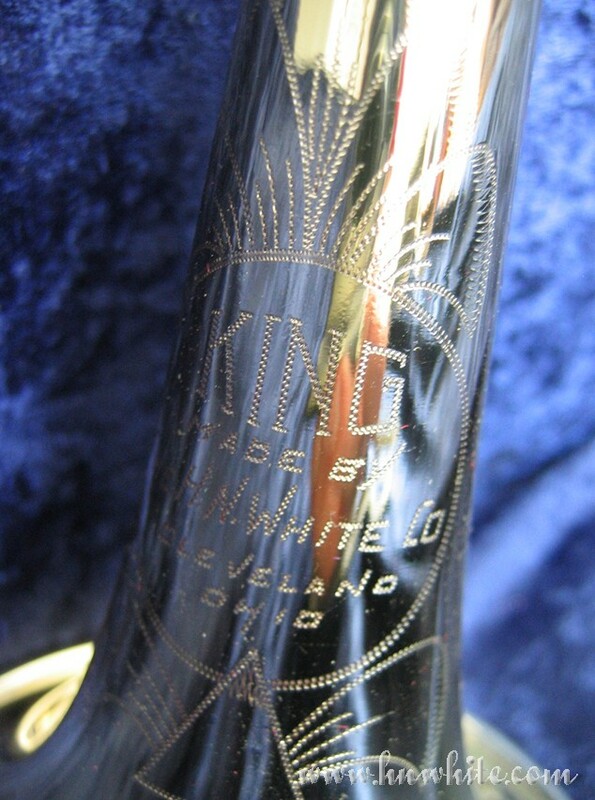 Engraved with the winners names: Mayfield High - Kenneth Johnson, Warrensville High - Tom Dorony & Ralph Bertonaschi, and Bush High - Tom Inck. 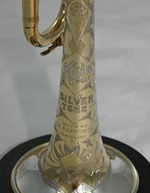 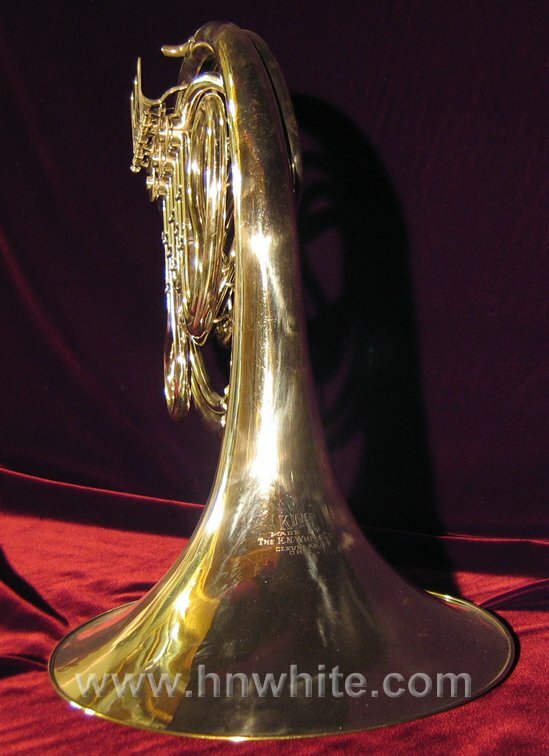 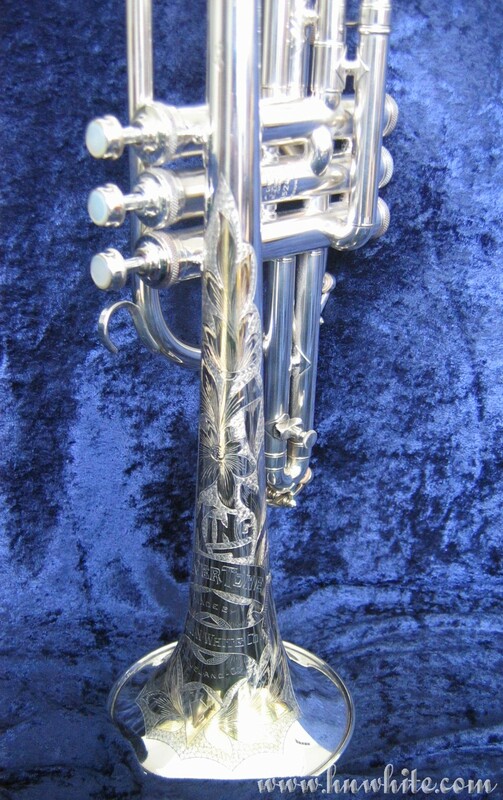 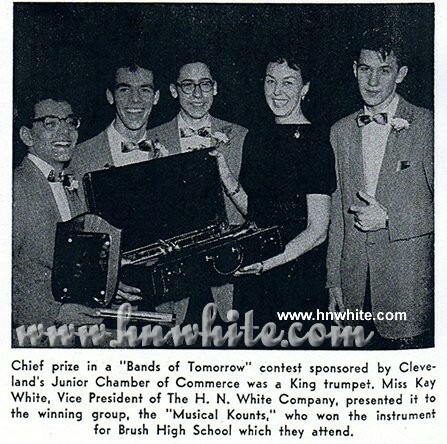 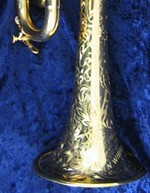 The trumpet was awarded in 1958 by Kay White and is now in our collection. 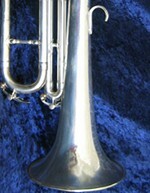 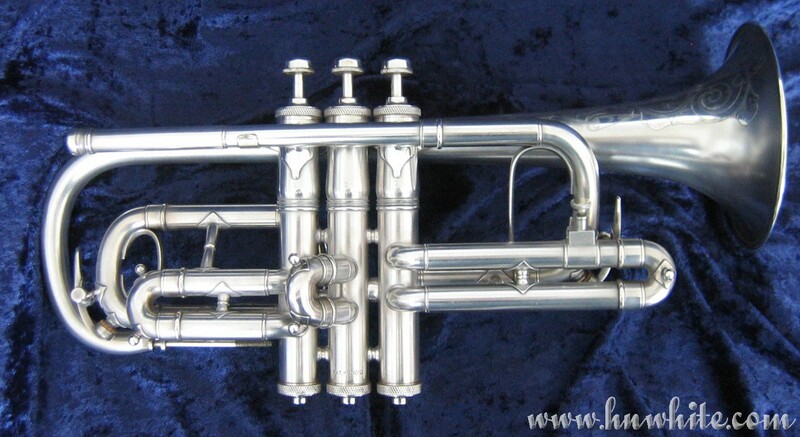 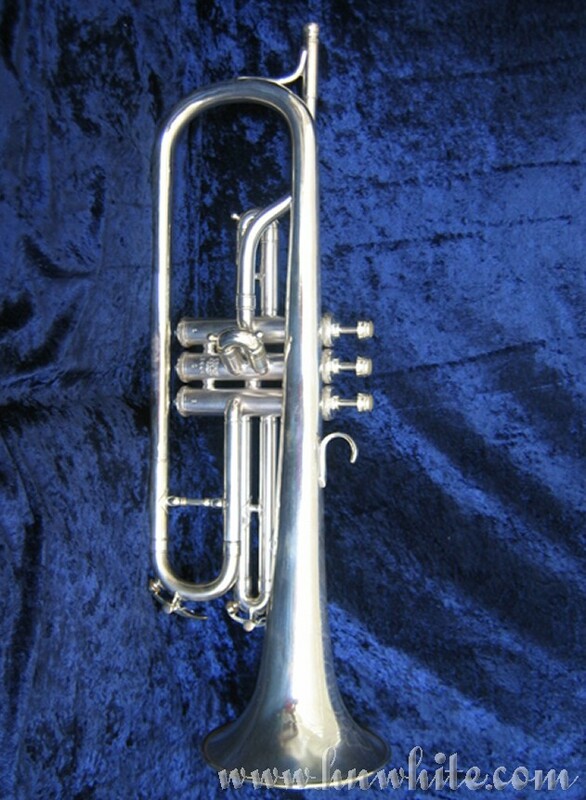 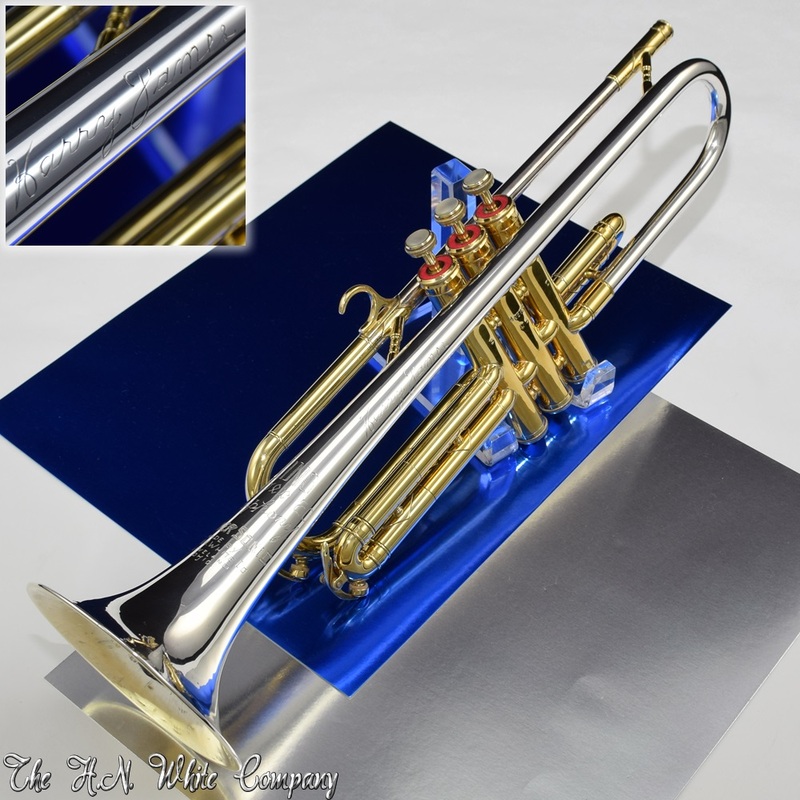 This Super 20 Symphony Silversonic dual bore trumpet is unique. 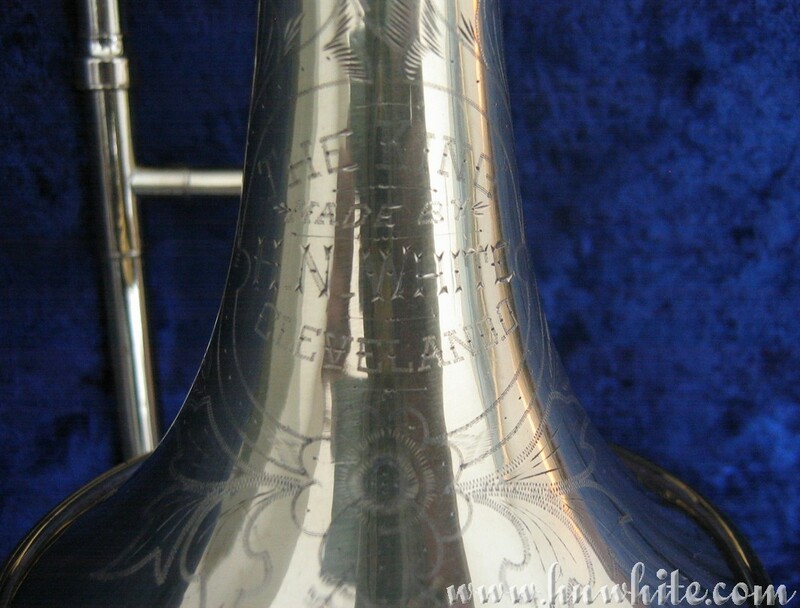 The valve section is moved closer to the bell making it just like Harry James' trumpets. 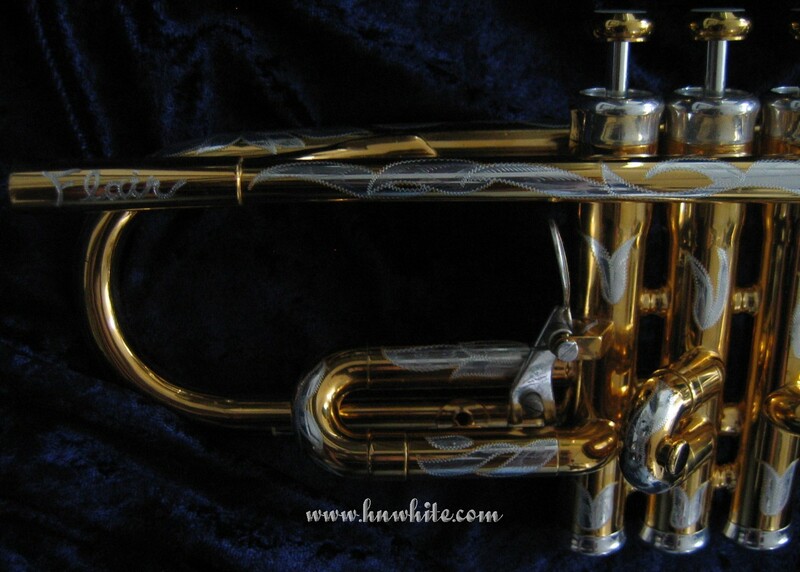 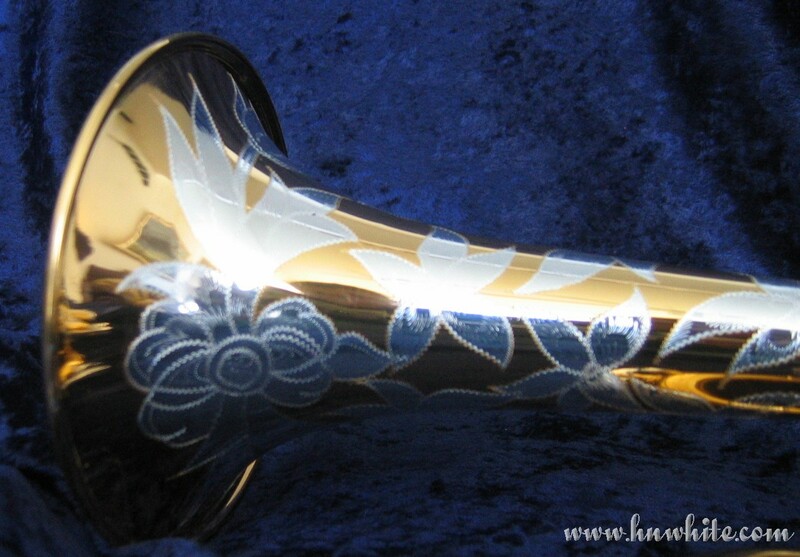 This trumpet was custom made to our design. 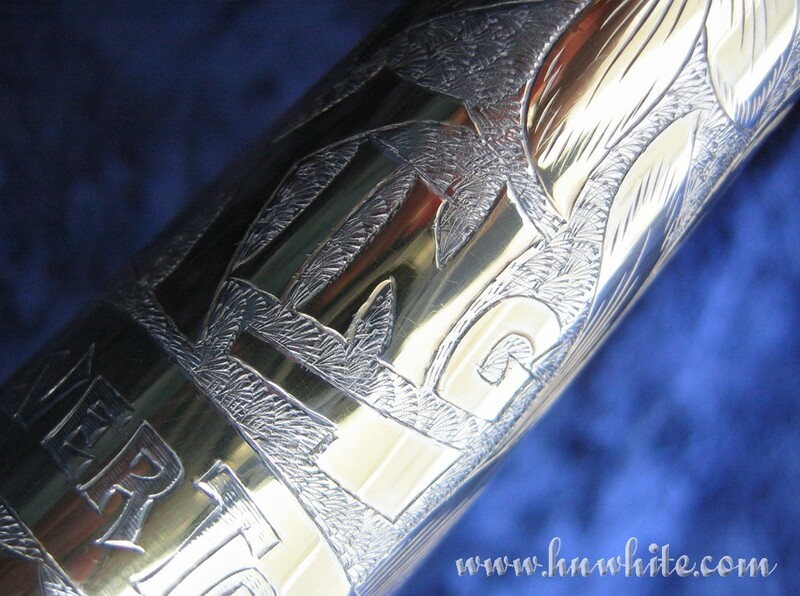 Featuring gold/silver reverse plating with custom design engraving! 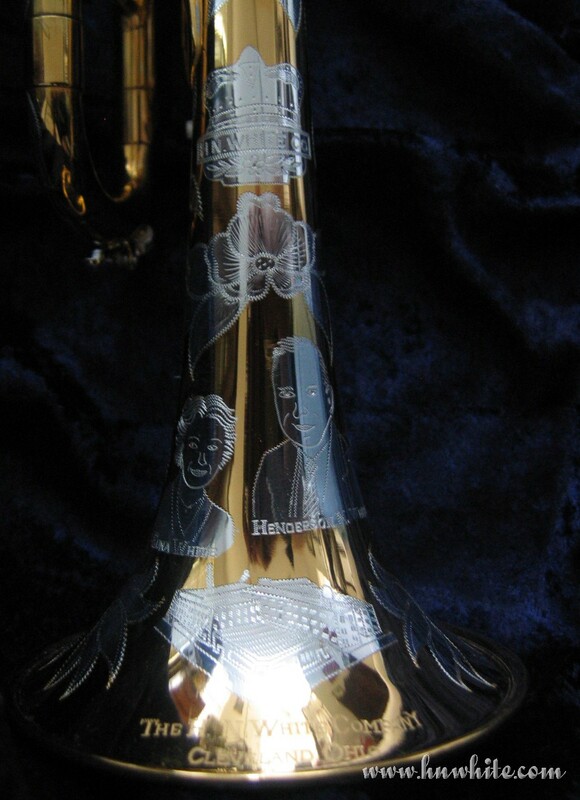 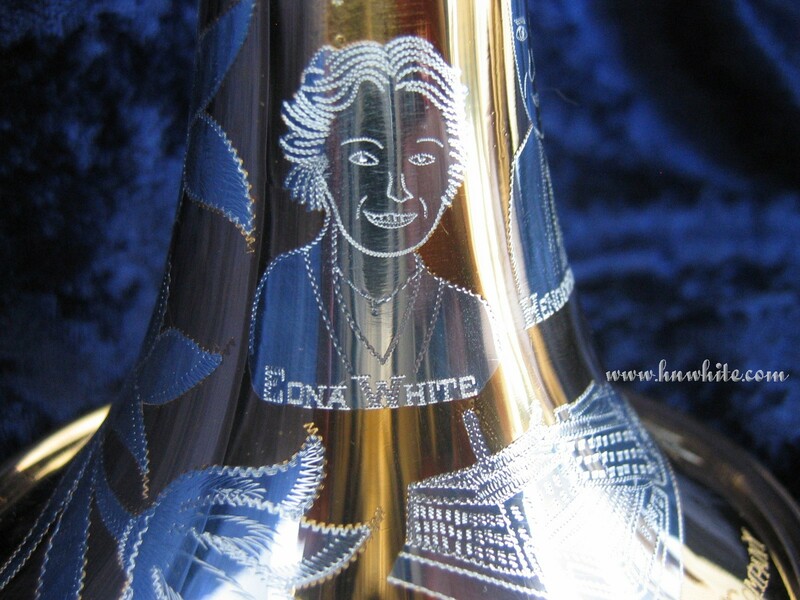 This trumpet has silhouettes of both Edna and HN White! 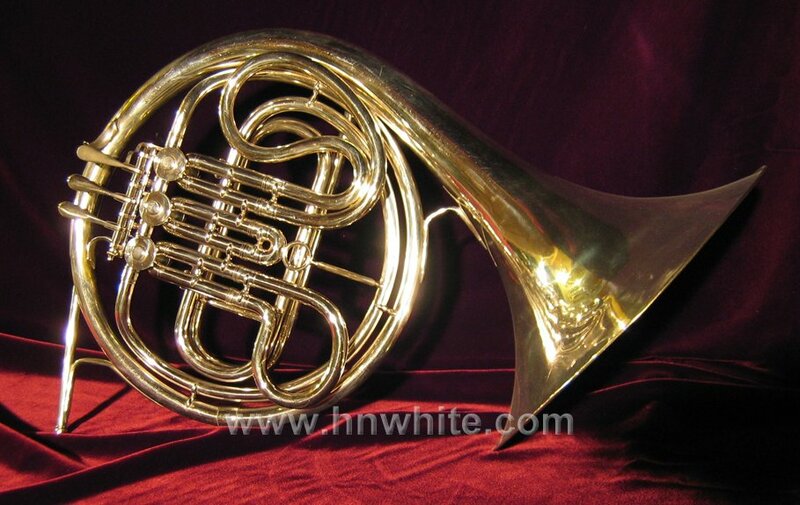 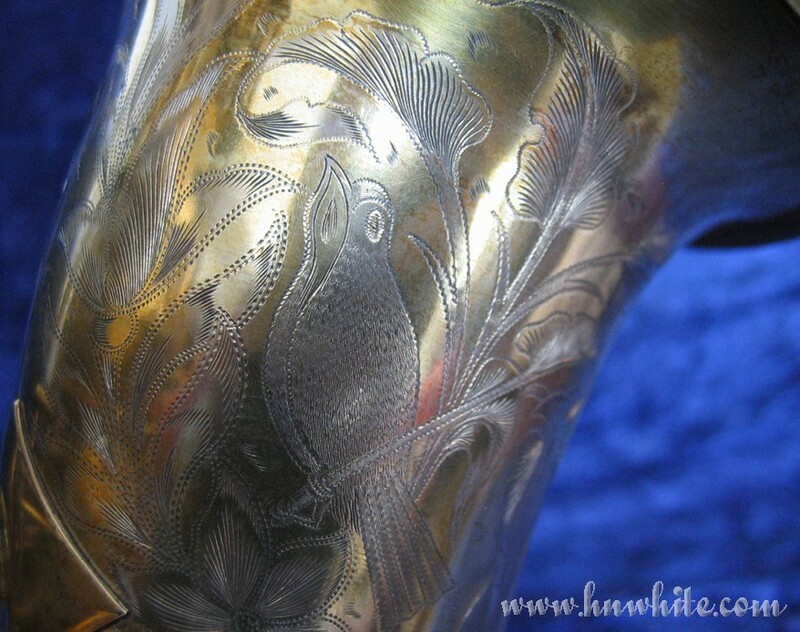 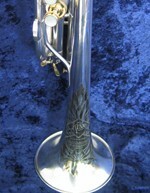 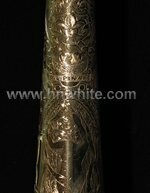 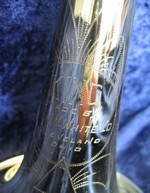 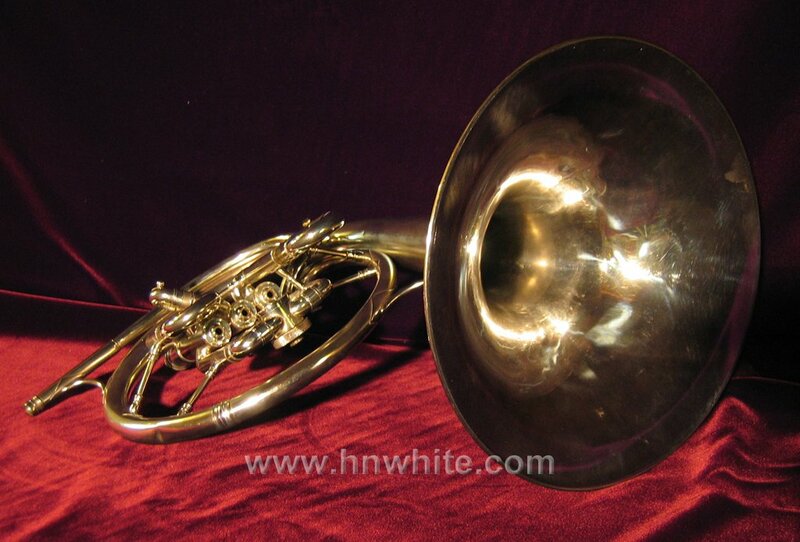 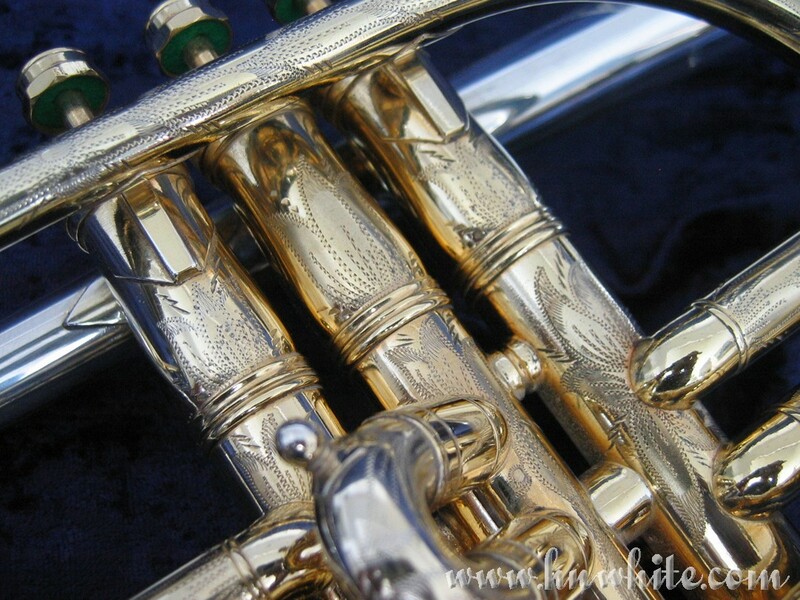 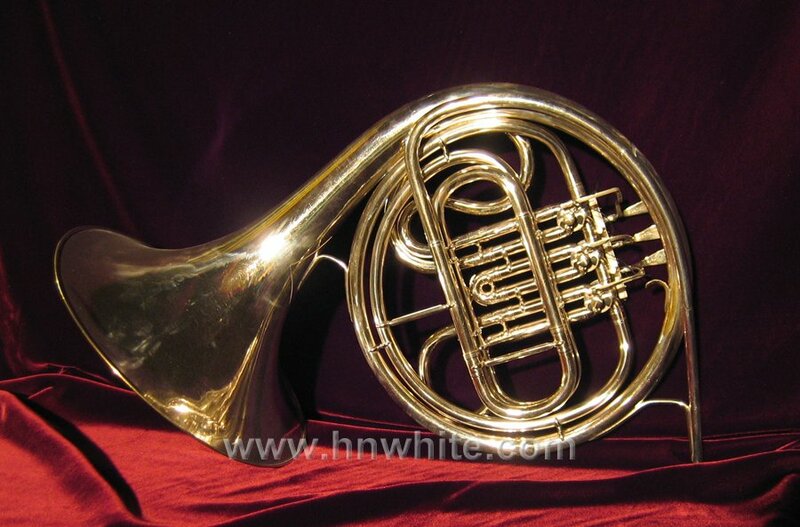 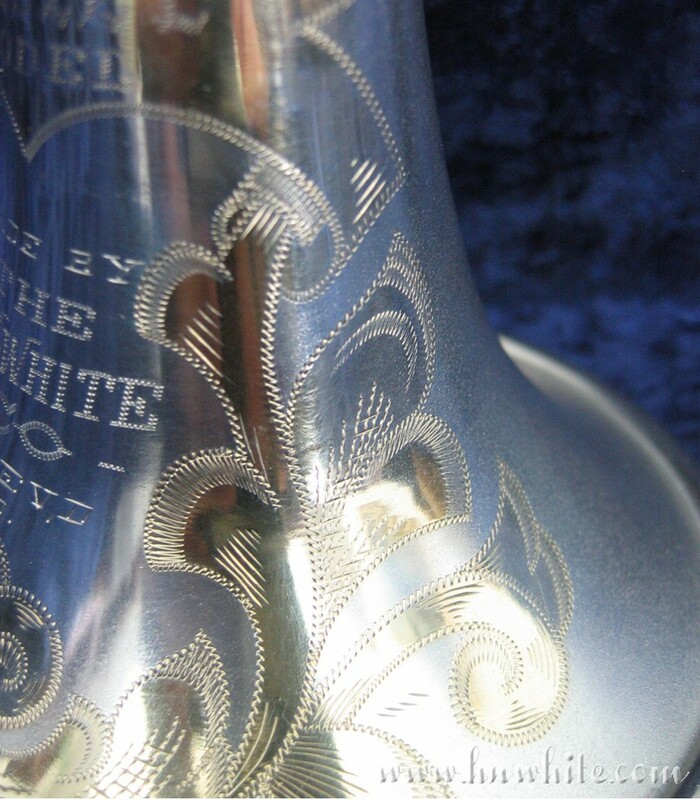 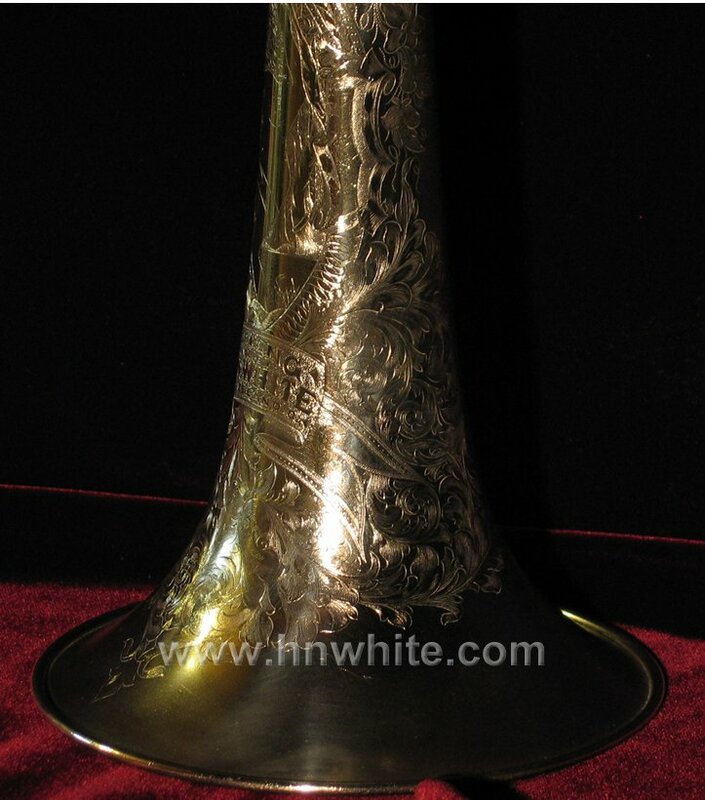 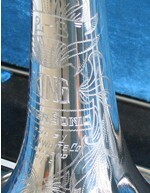 H. N. White cornets are among the best ever made, most are in medium bore. 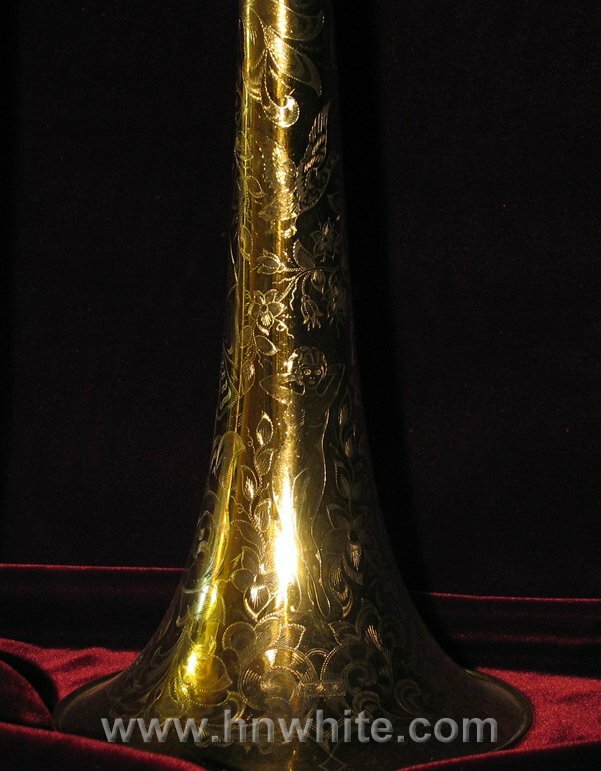 Made around 1900, this is the oldest instrument in the collection. 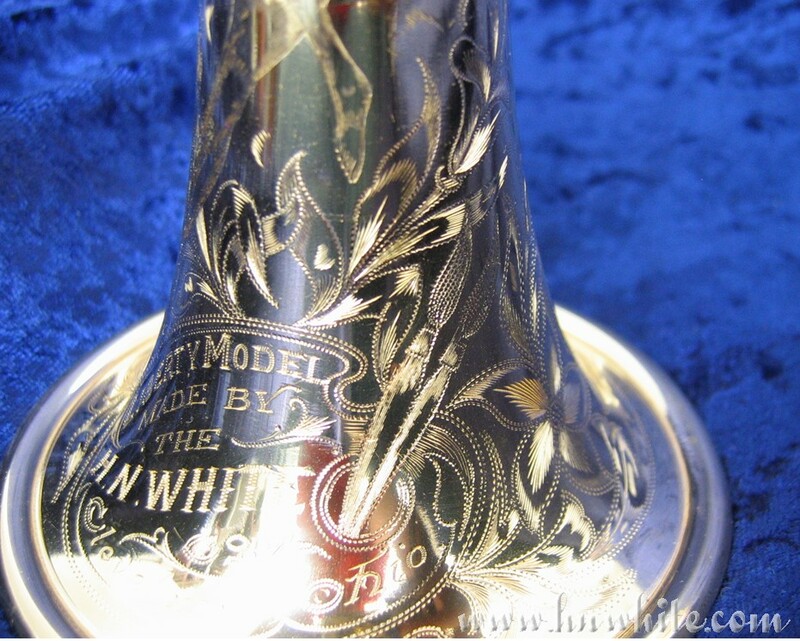 Made around 1911, this cornet has original case with fittings to change to A and c.
Made around 1928, this mint cornet shows the level of craftsmanship that the White Company was able to achieve! 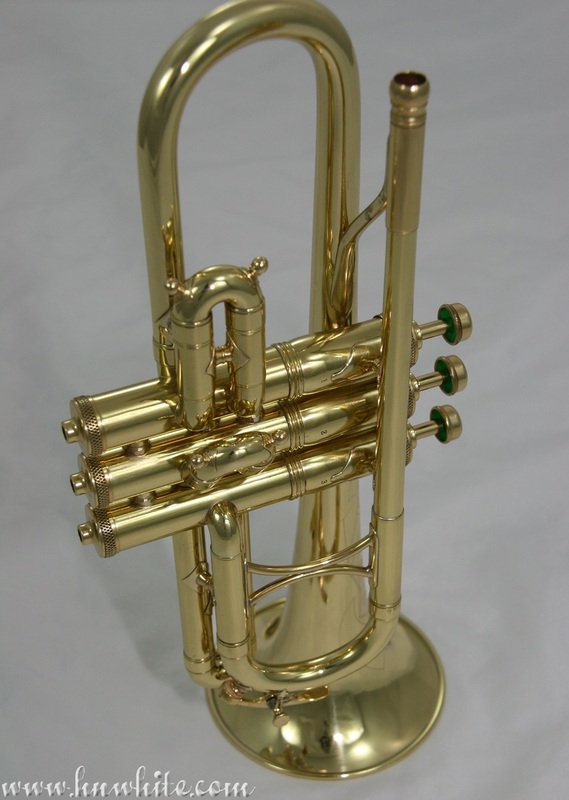 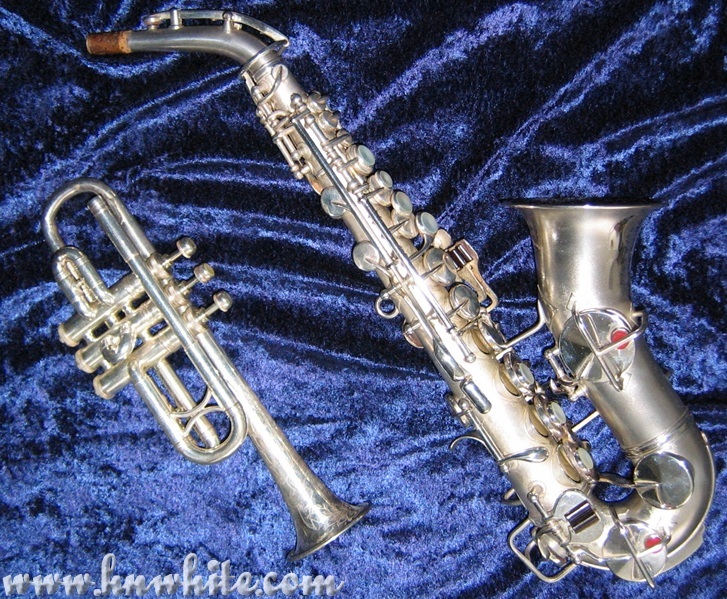 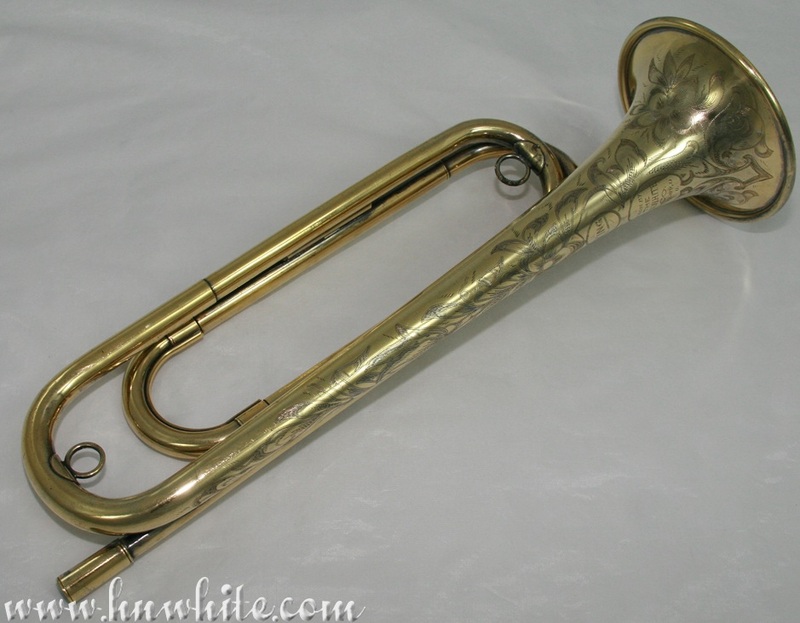 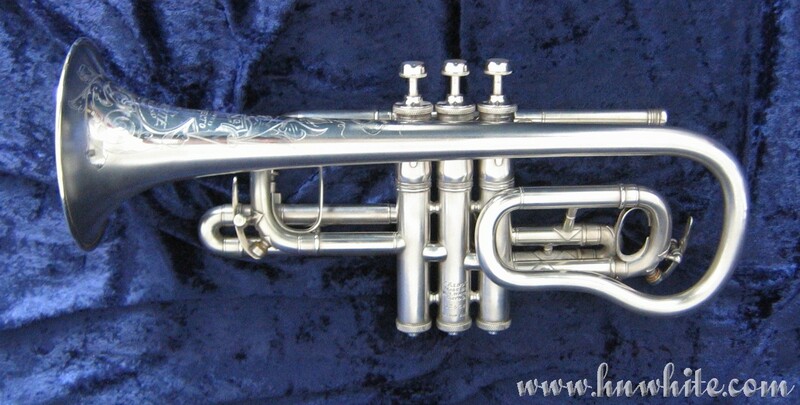 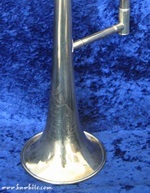 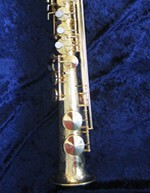 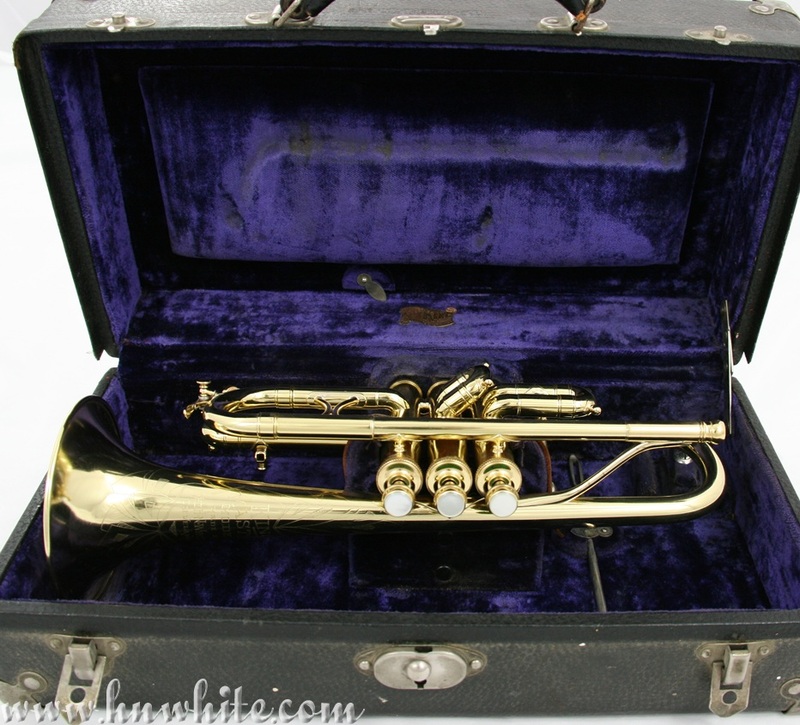 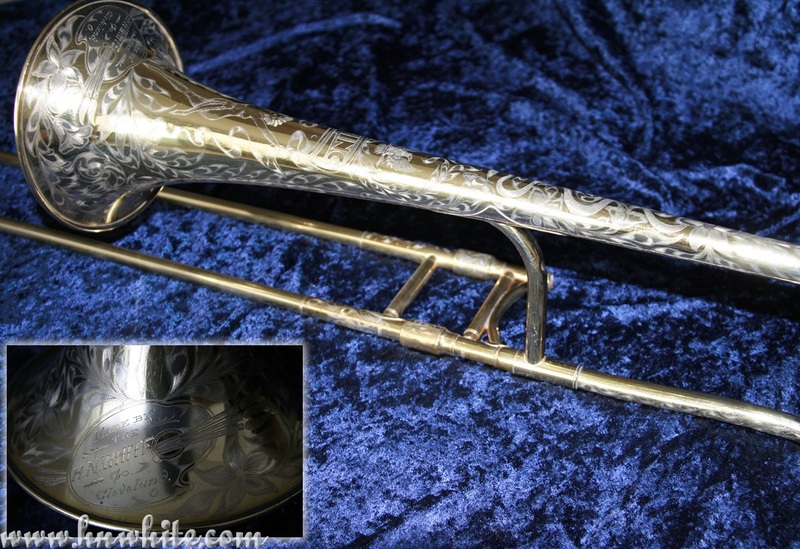 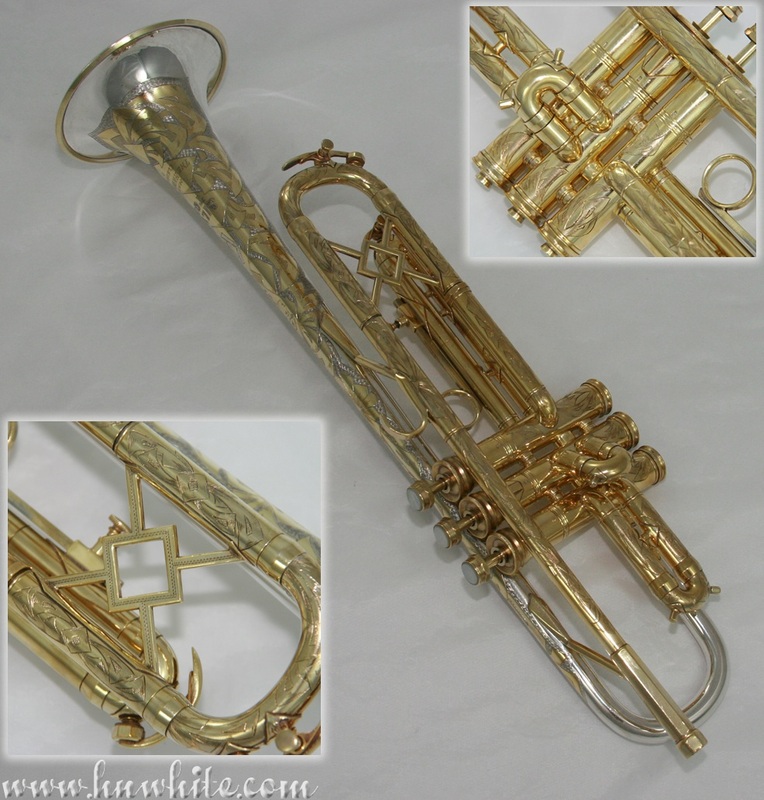 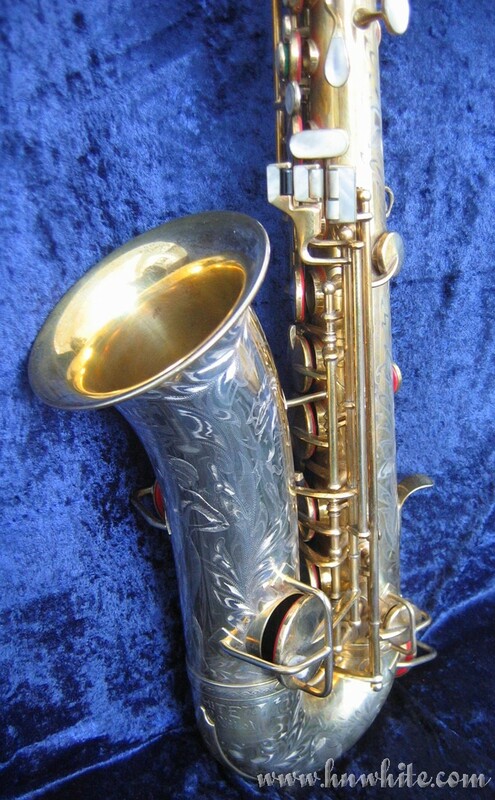 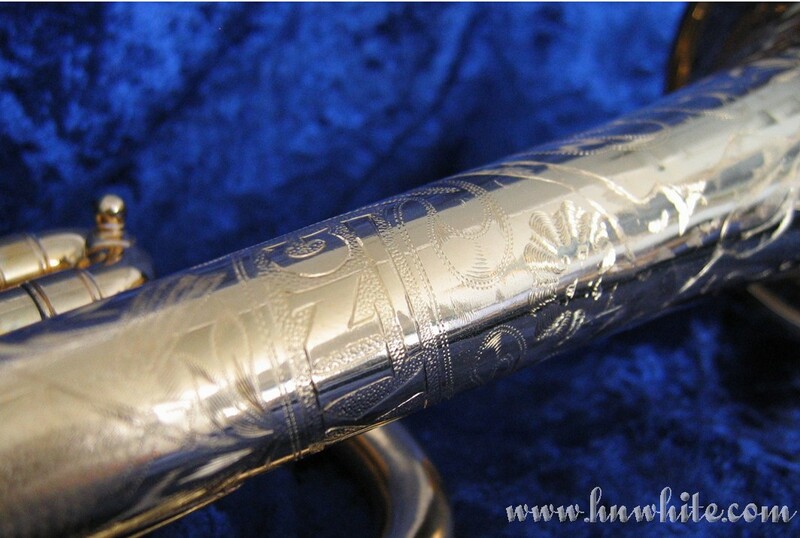 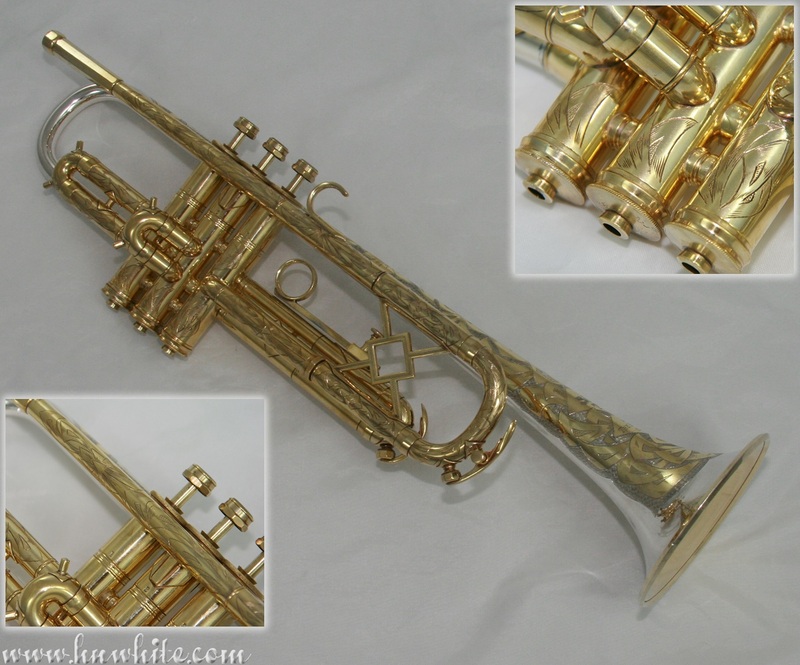 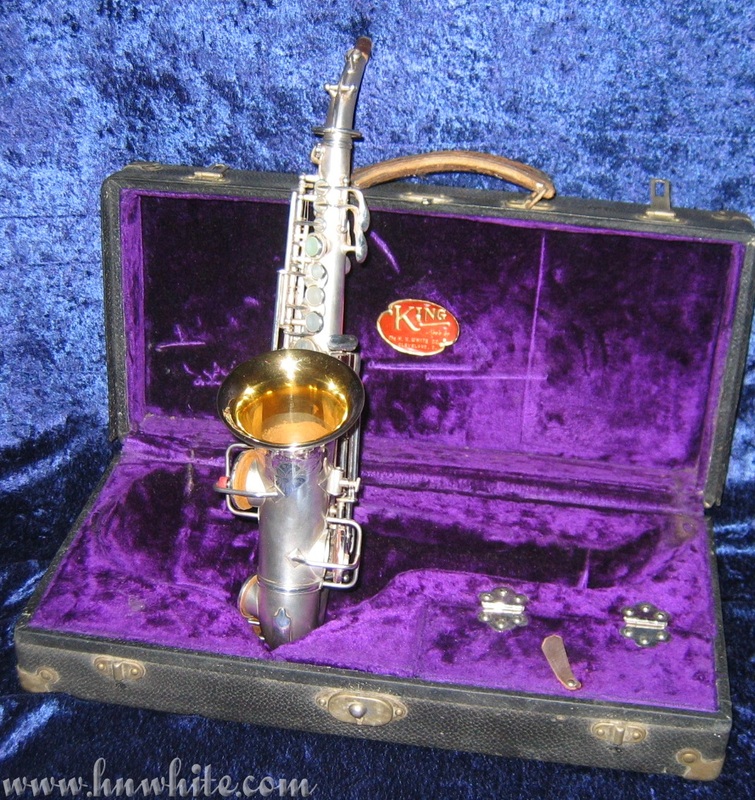 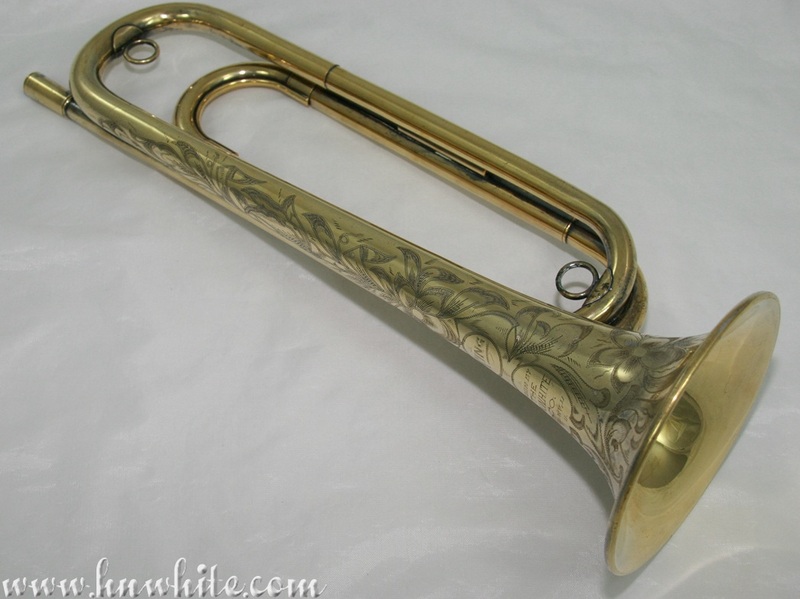 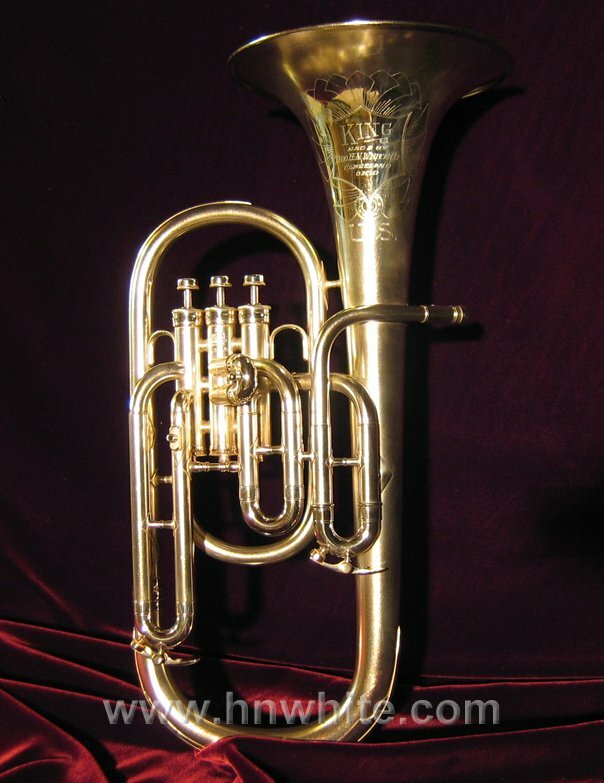 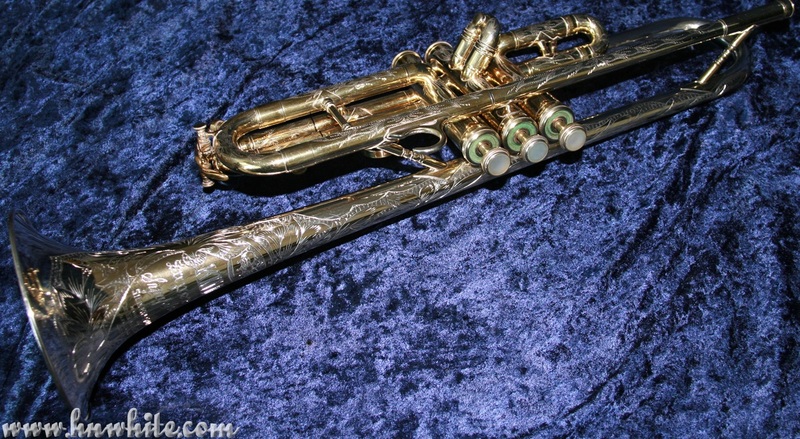 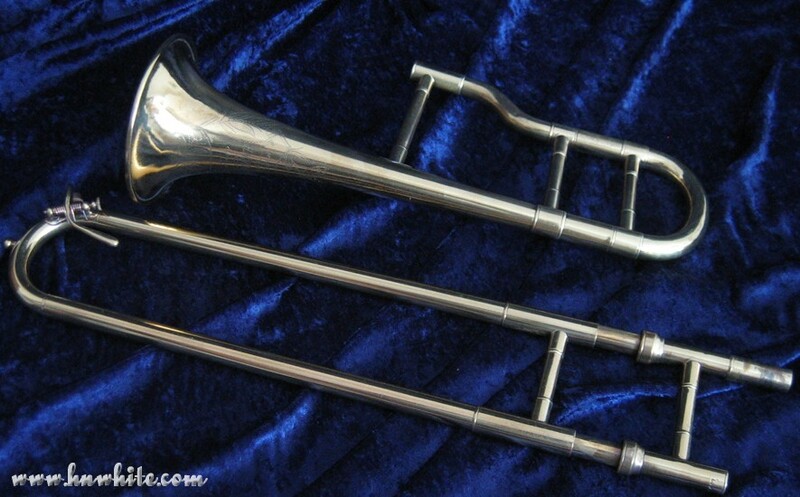 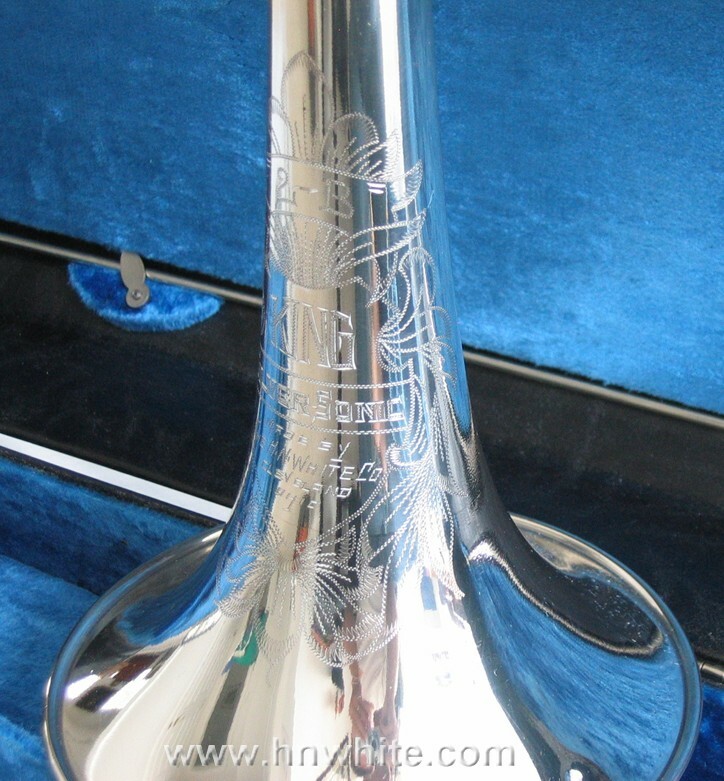 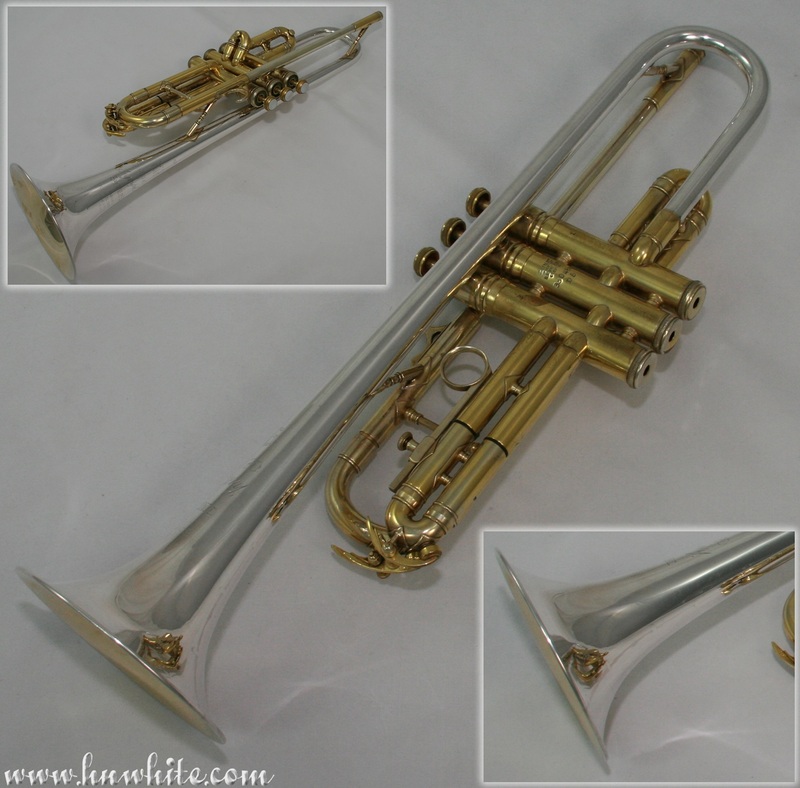 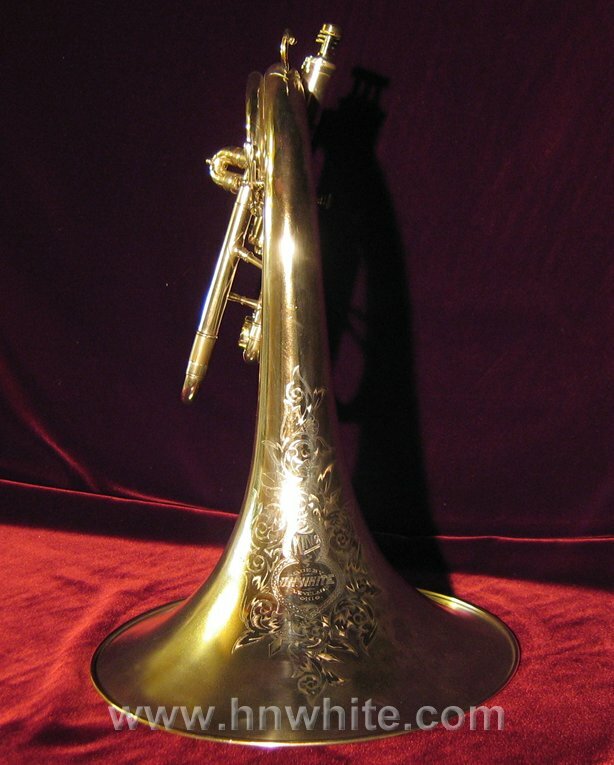 Made in 1937, this extremely rare Eb Cornet is one of two known to exists. 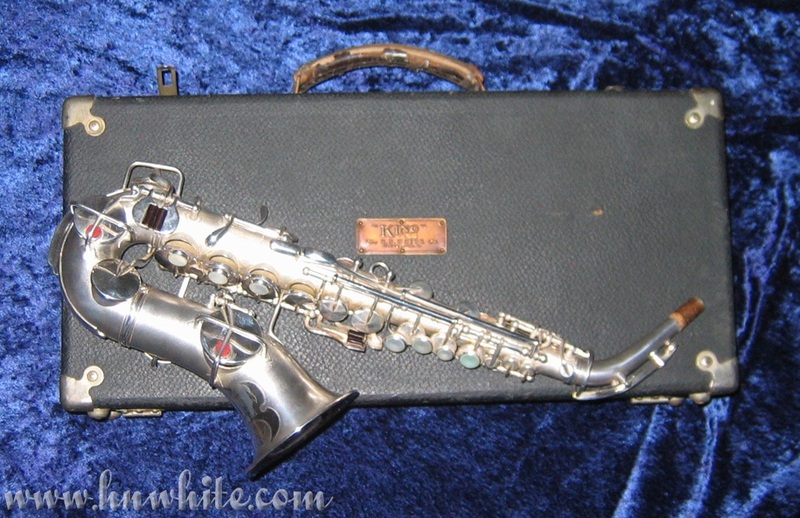 Made in 1940, this instrument was only in limited production and very few are known to be in playable condition. 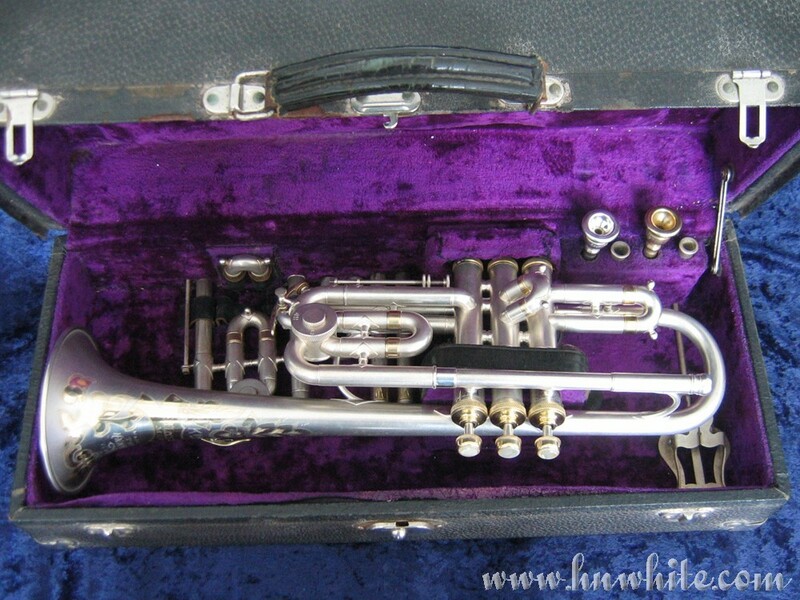 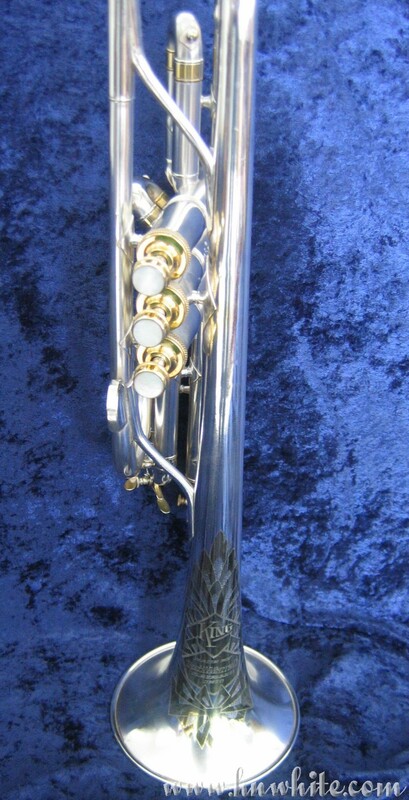 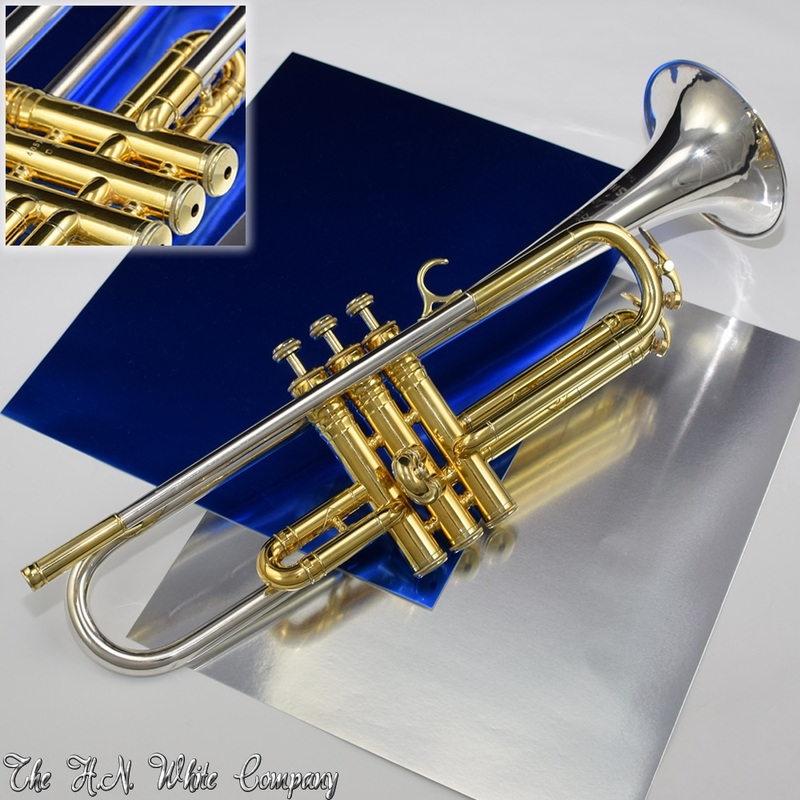 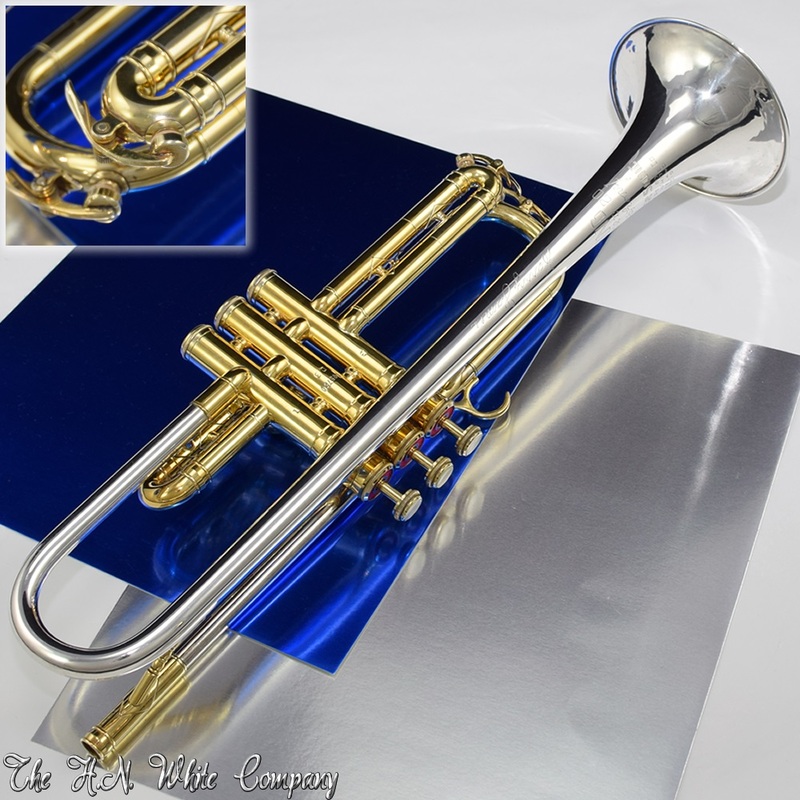 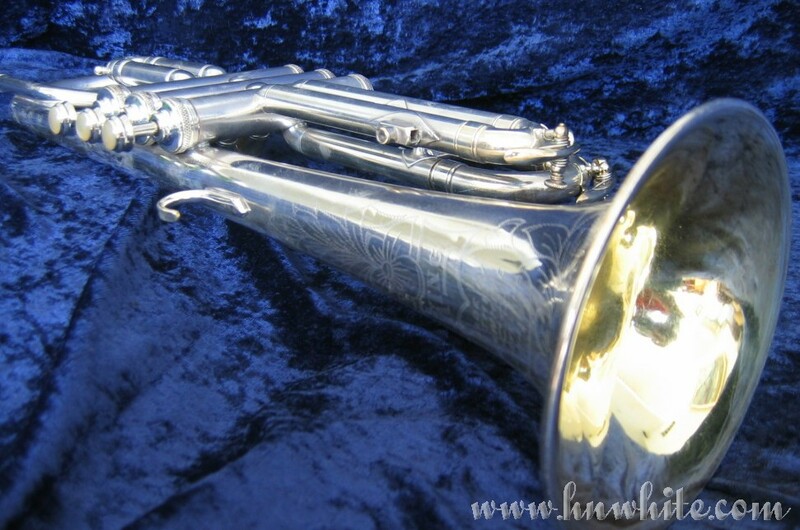 Made in 1955, this cornet in among the last of the "Artist Level Specials" ever made! 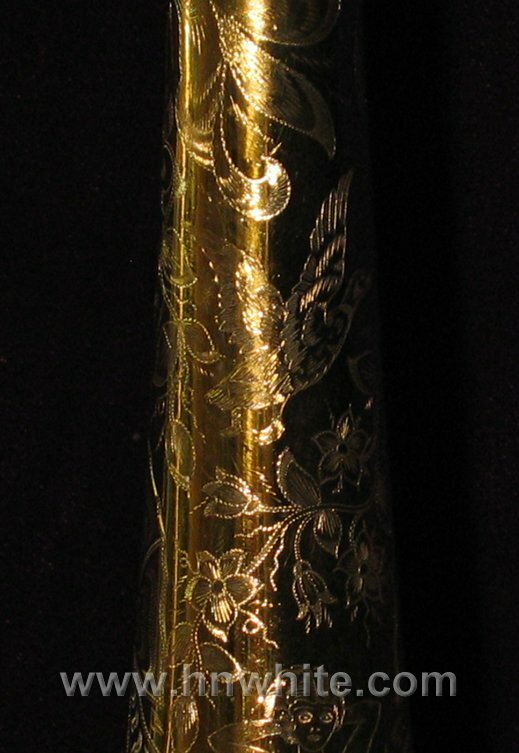 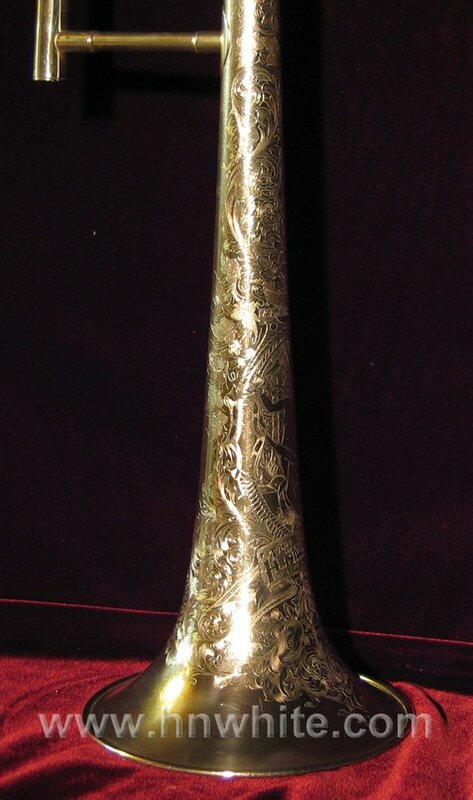 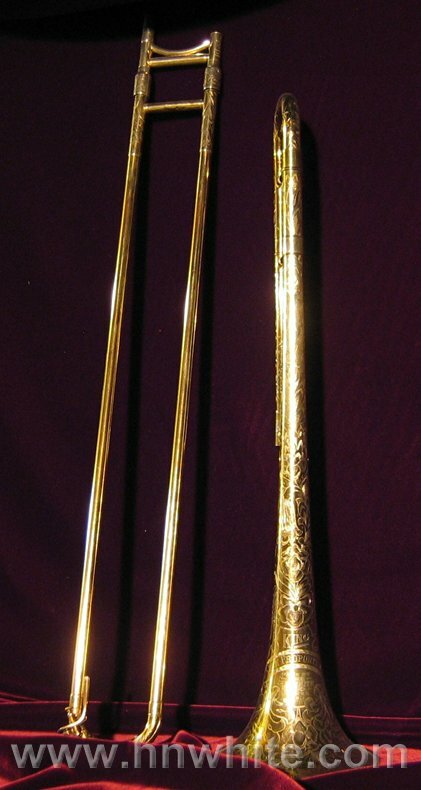 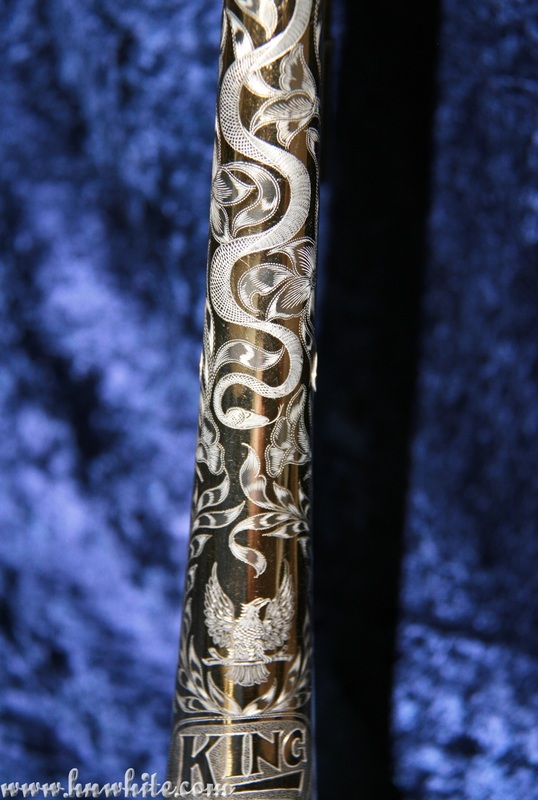 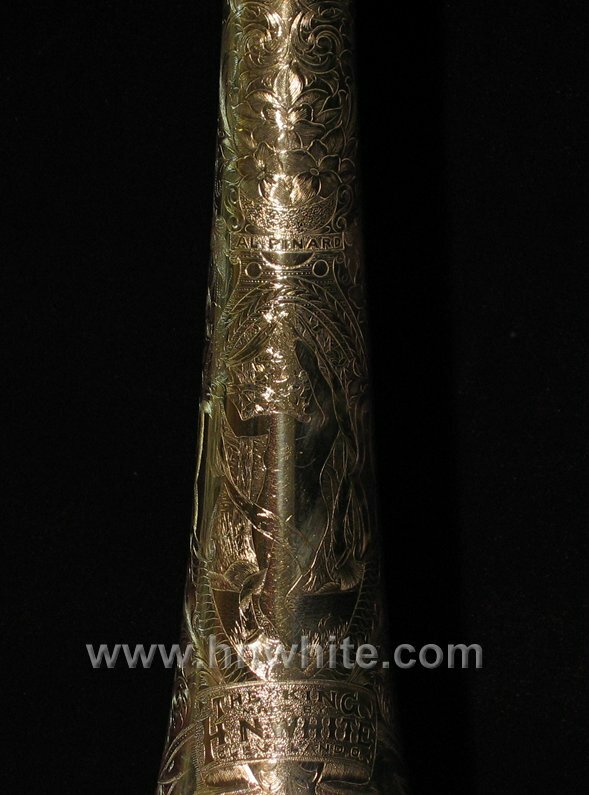 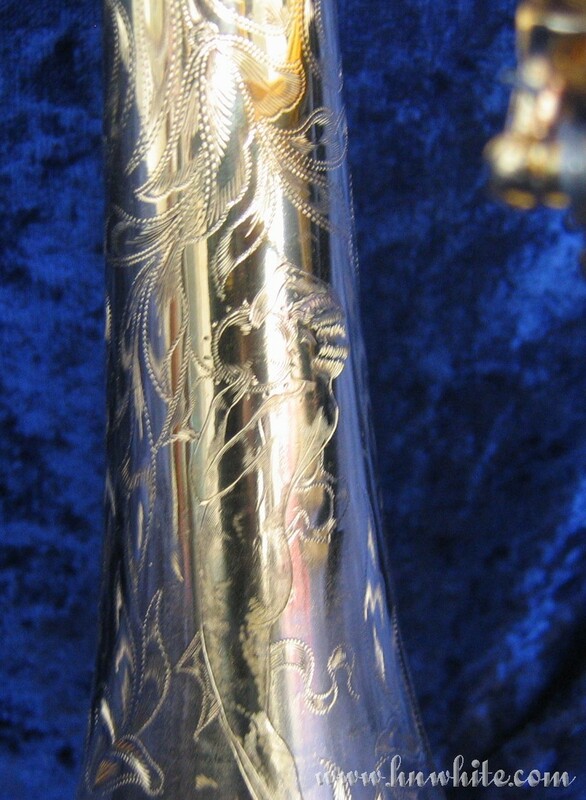 It is much more common to see artist level engraved instruments before WWII. 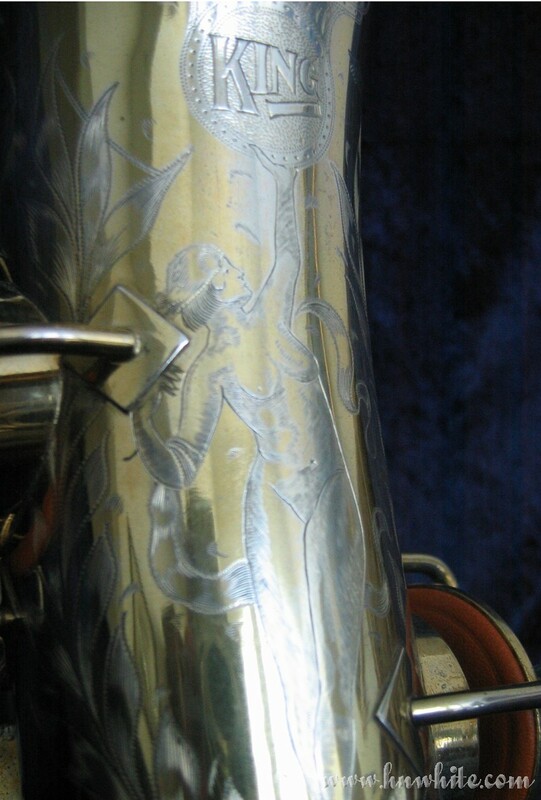 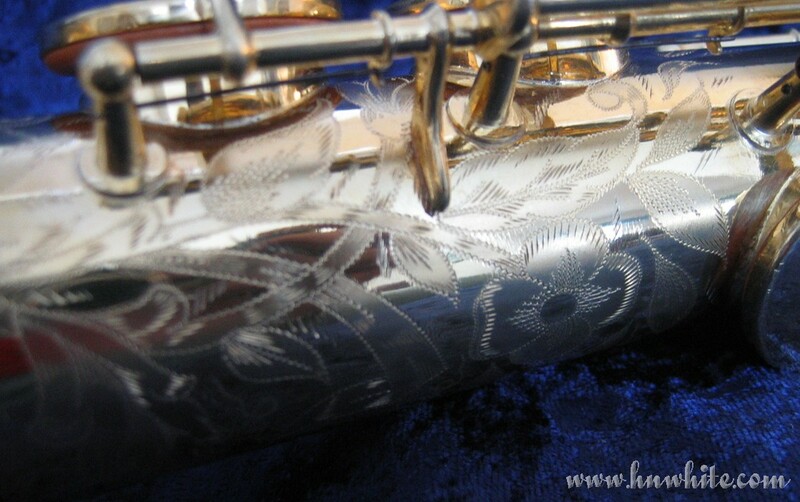 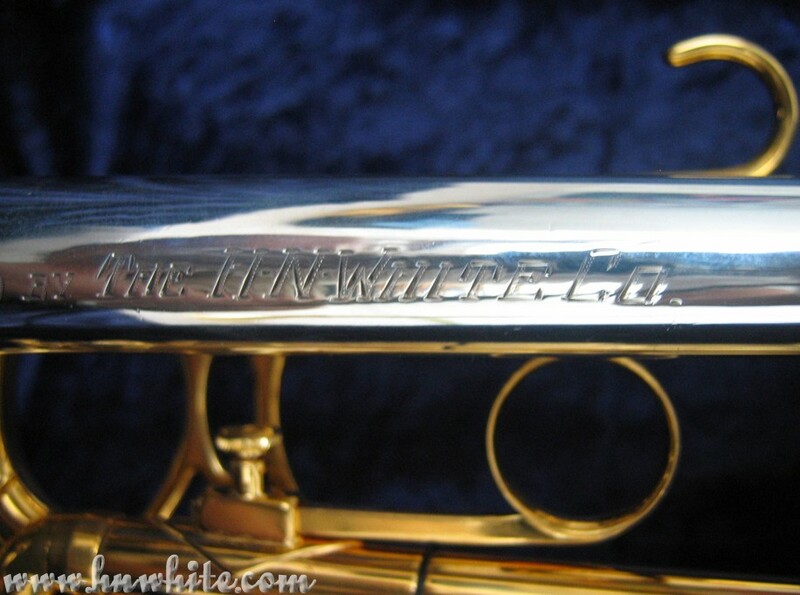 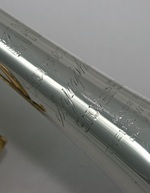 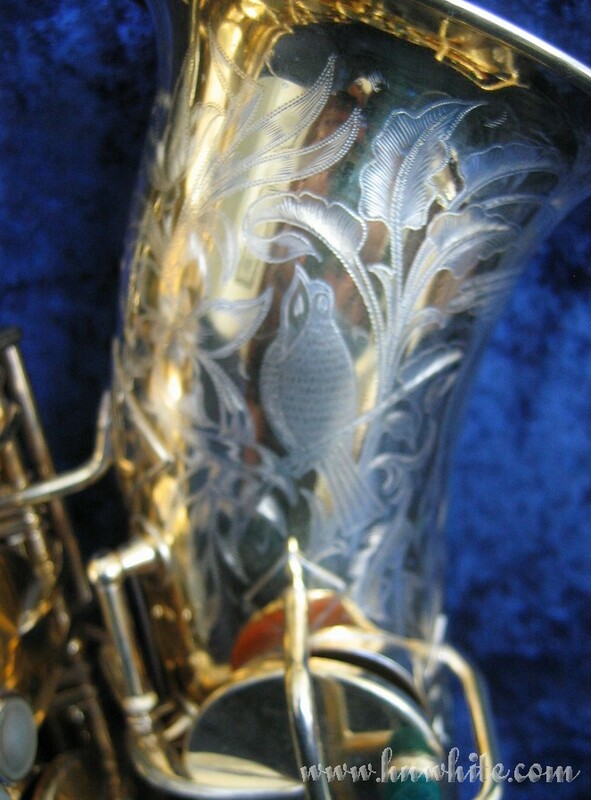 This in one of a handful of post WWII instruments that I have seen that are engraved to the artist level. 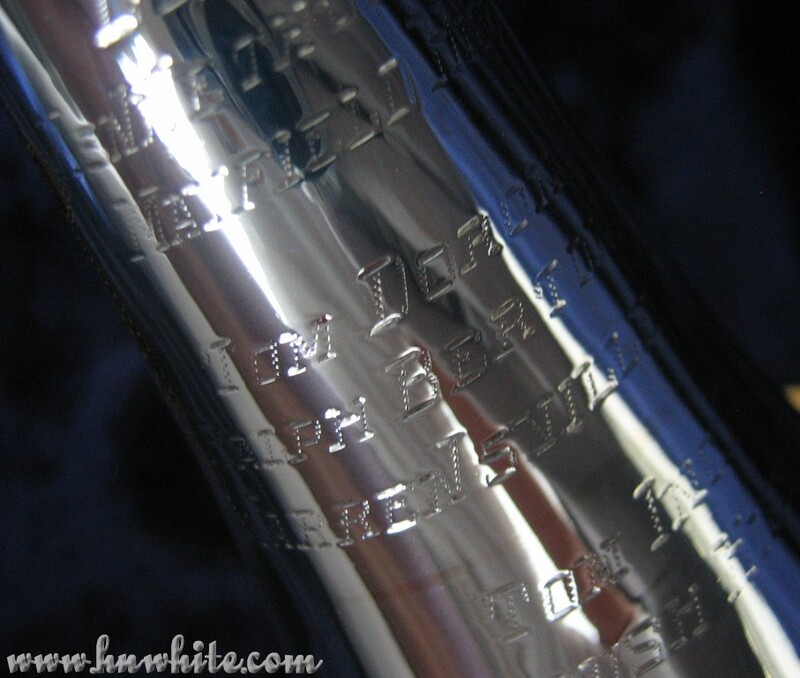 Yes, I said it! 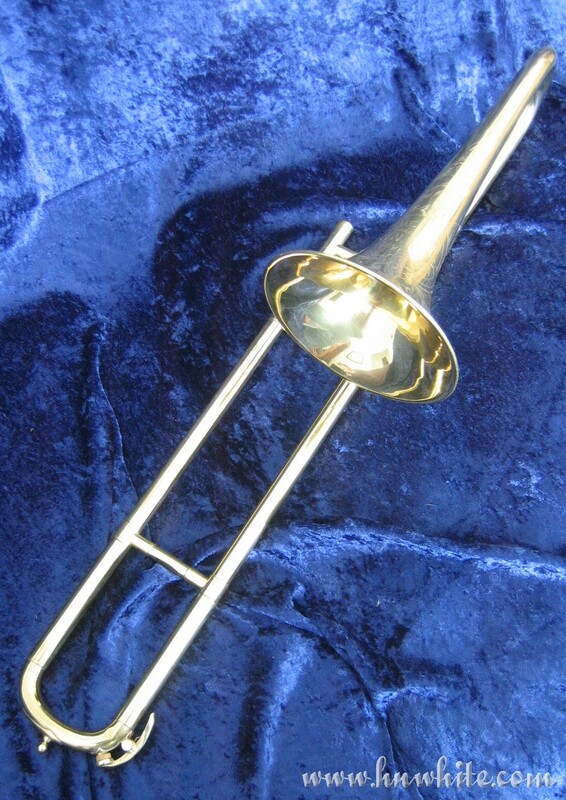 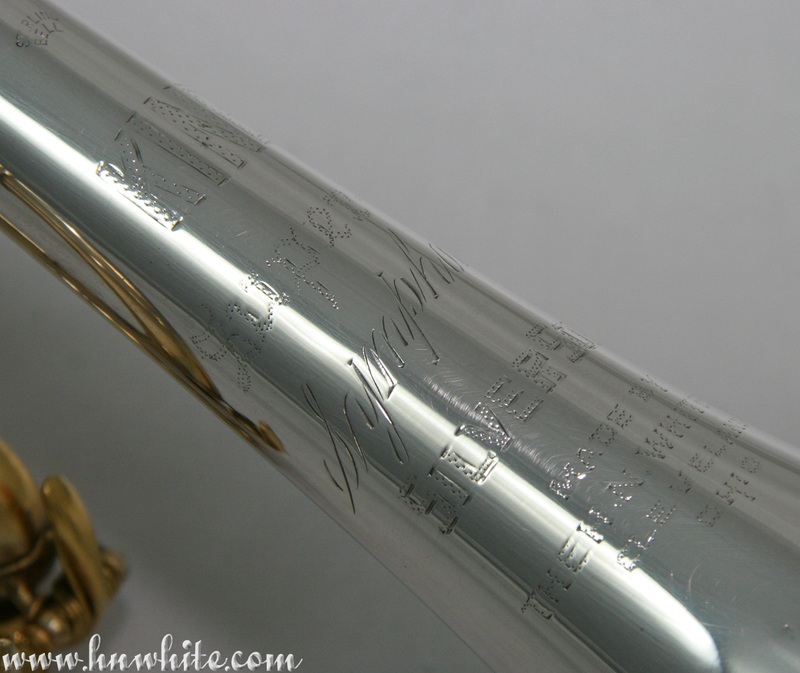 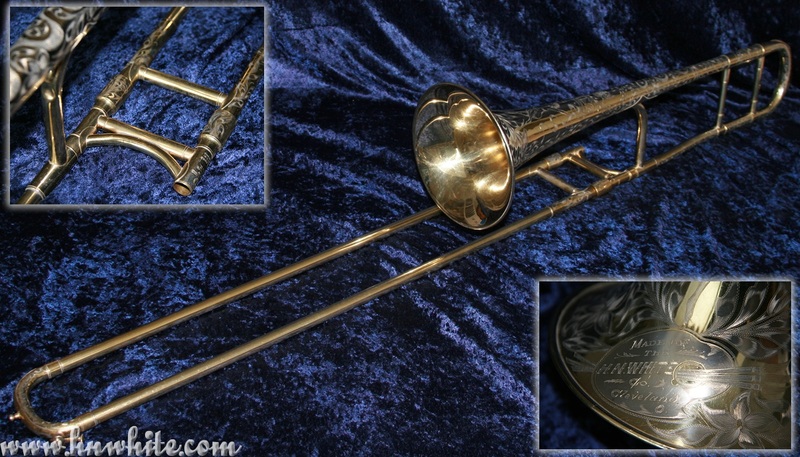 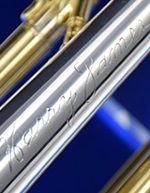 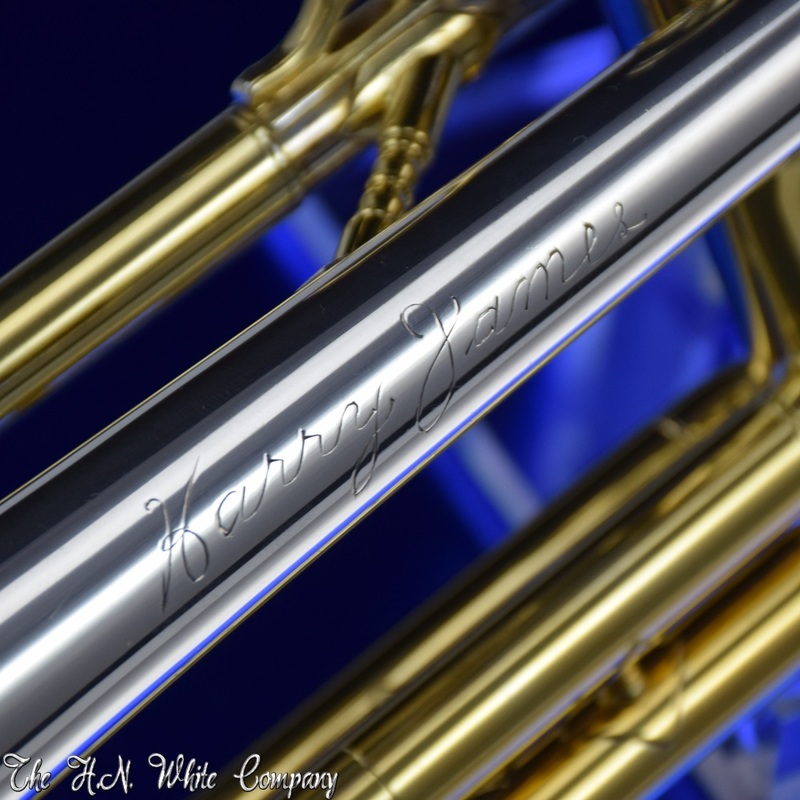 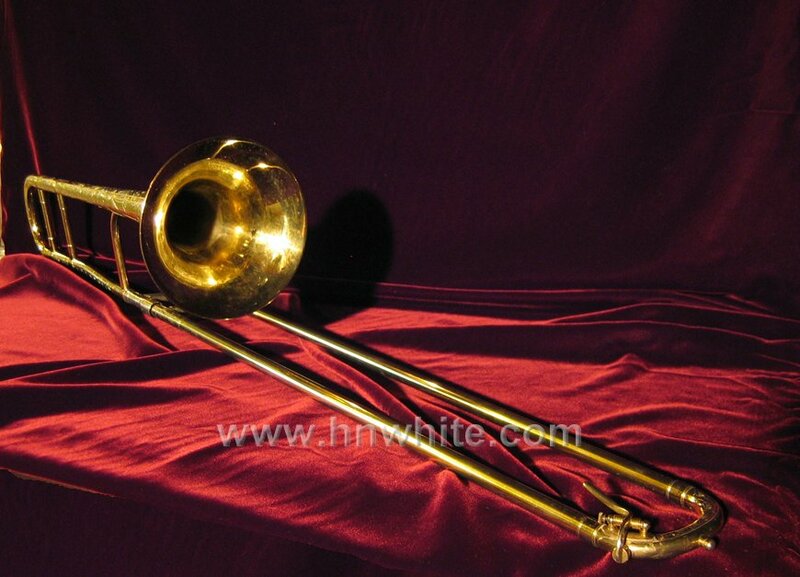 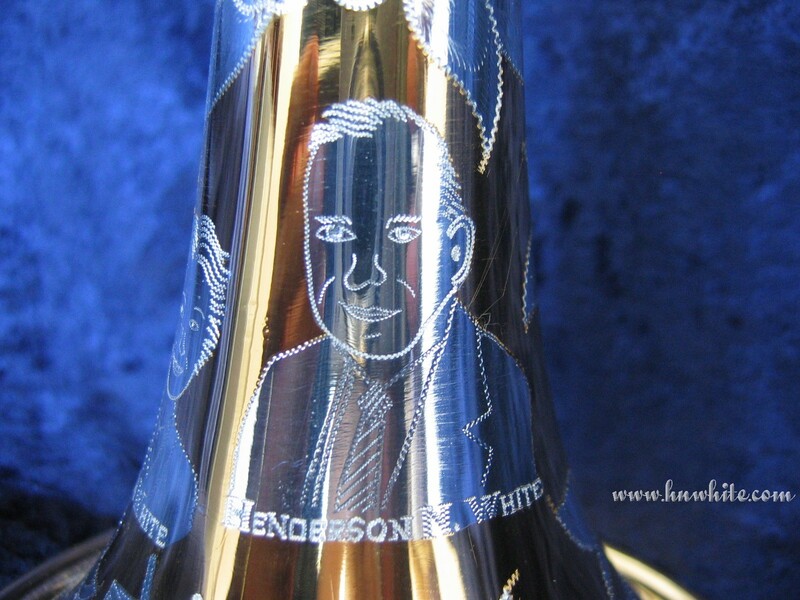 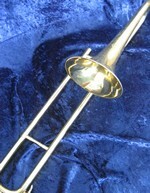 There is no debate that H. N. White made trombones are among the best ever made! 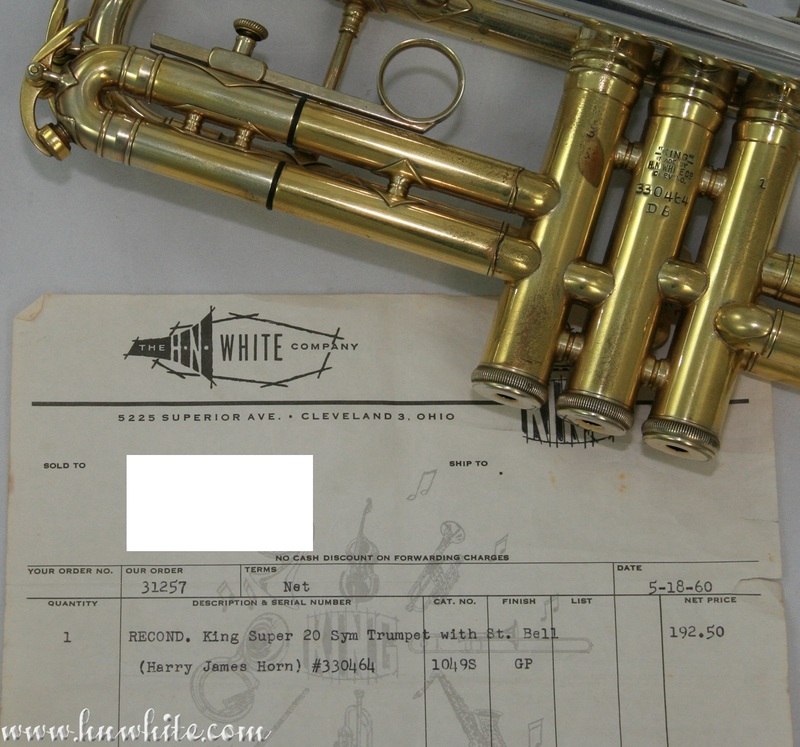 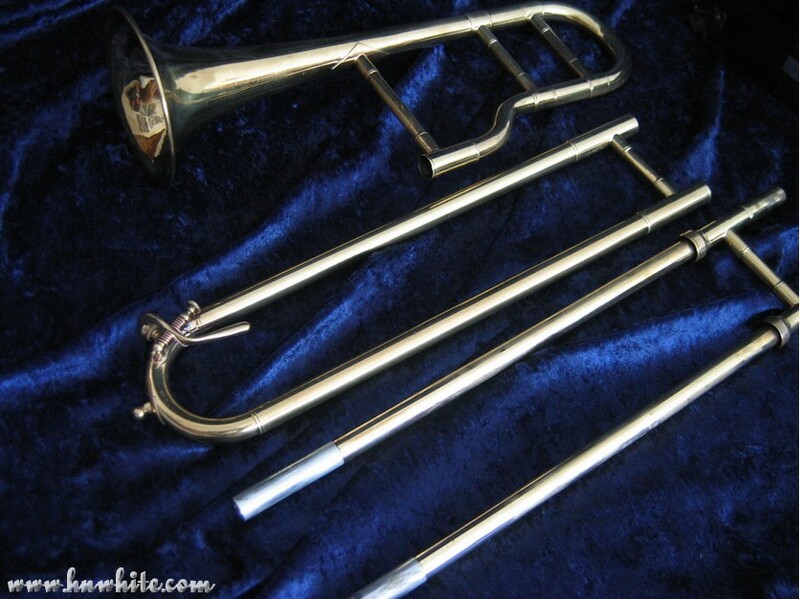 The H. N. White Company made more trombones then any other instrument, and for good reason, they were (are) the best! 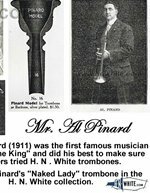 Made in 1905 this "Artist Special" was made for Mr. Al Pinard, his name is engraved into the bell. 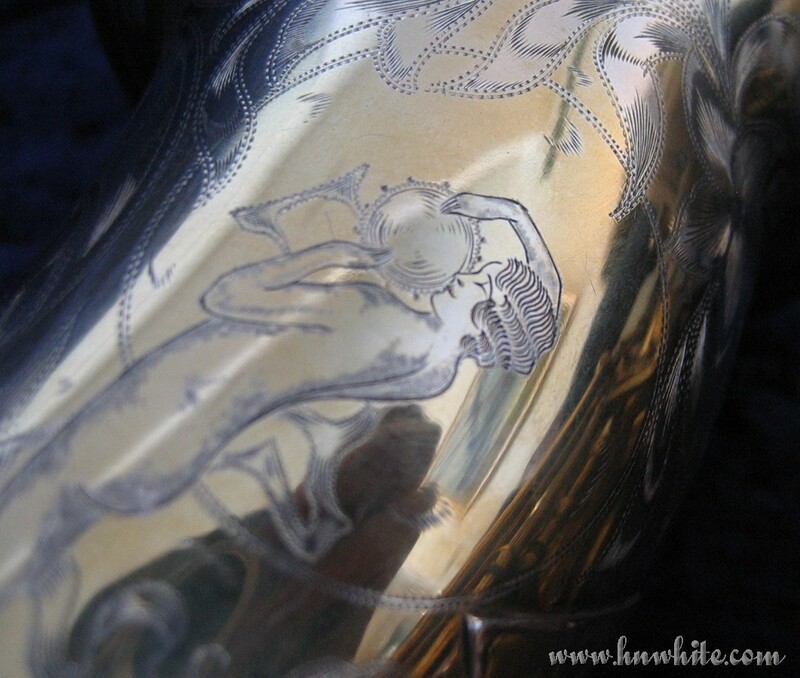 "The engraving is among the most detailed that I have seen." 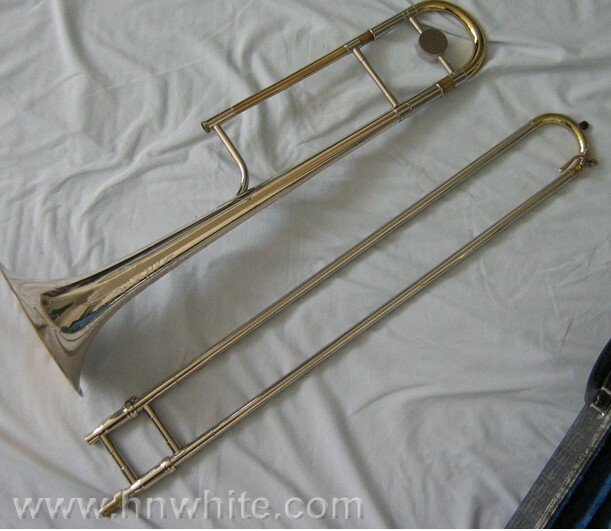 This Trombone is in mint condition and was made in 1960. 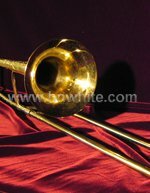 Possibly the best trombone ever made! 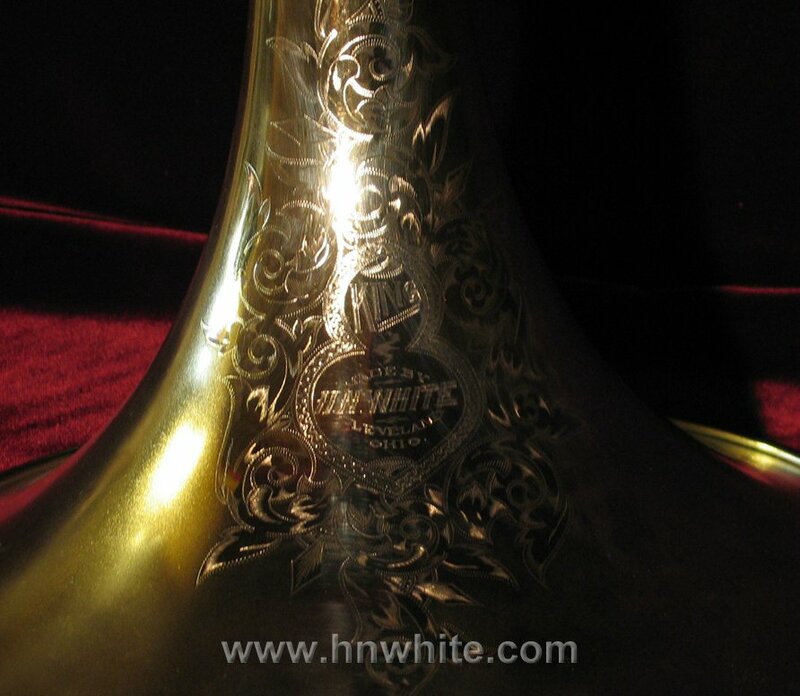 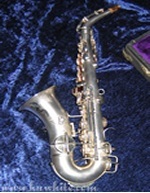 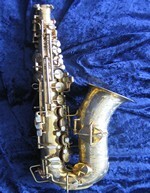 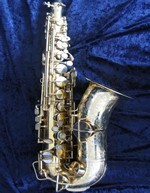 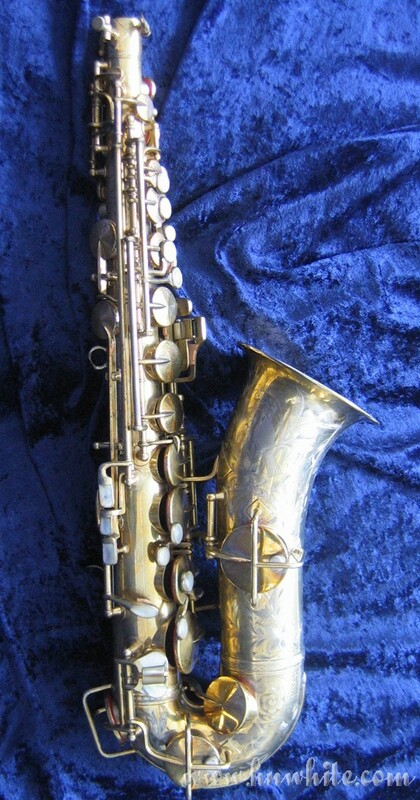 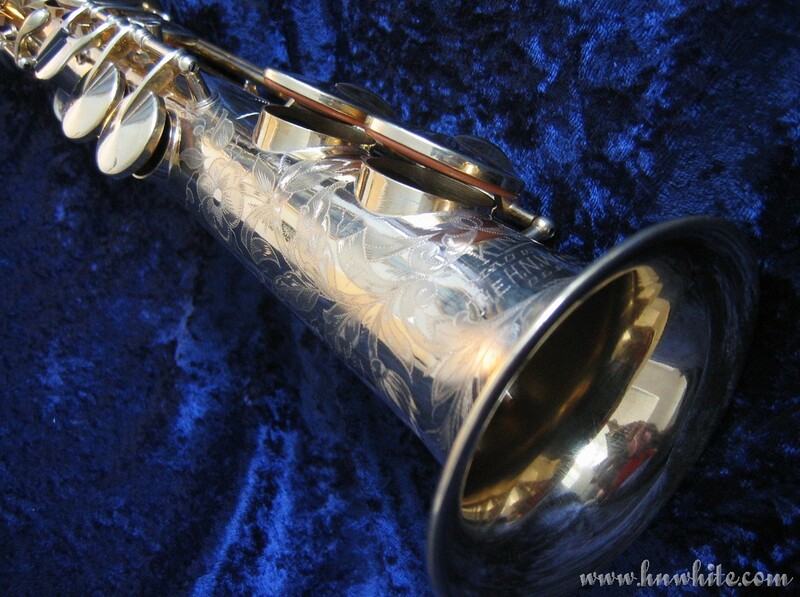 The H. N. White Company started out slow with saxophones and did not hit full stride until the development of the Super 20! 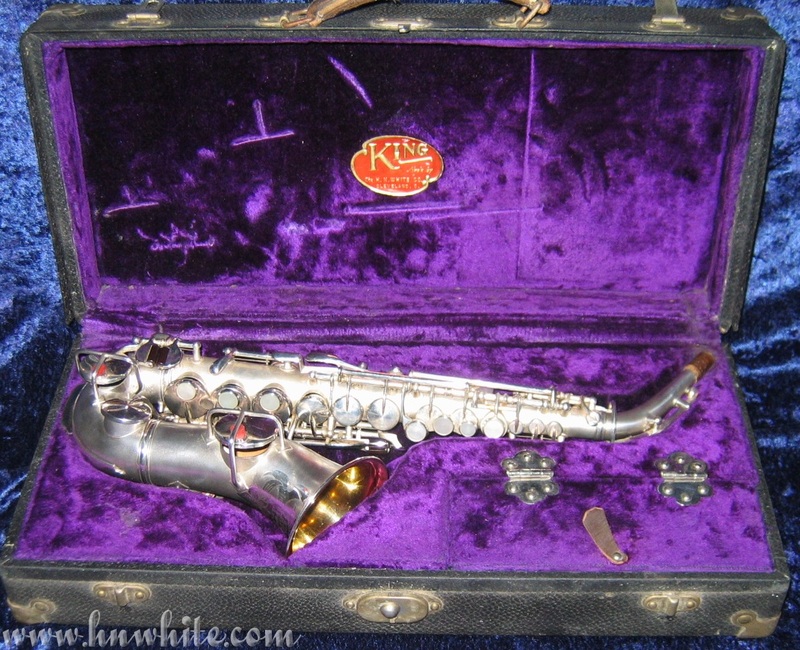 No pictures on this page are approved for use on www.ebay.com.